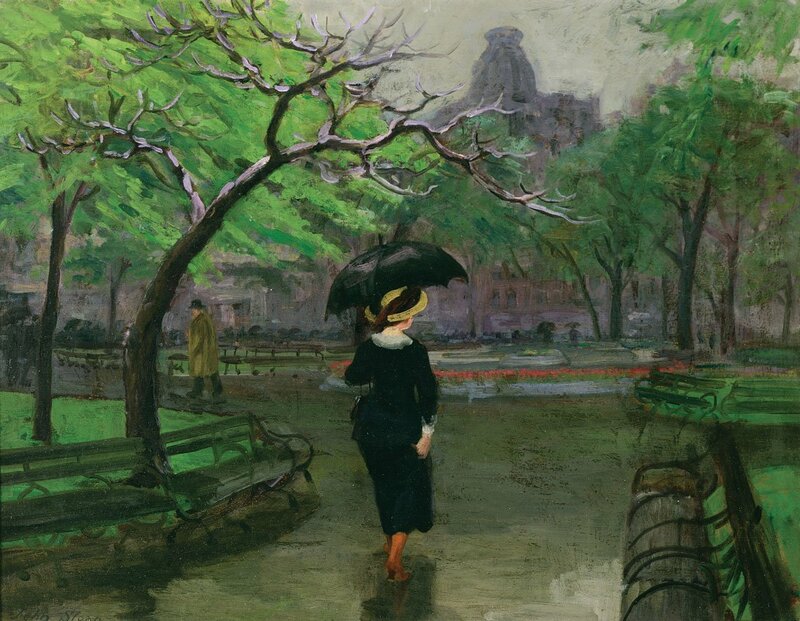 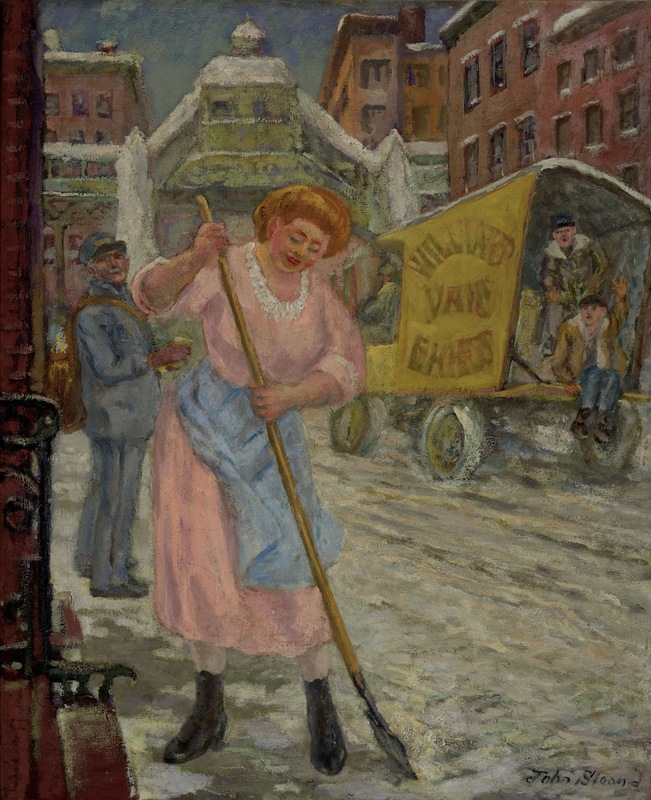 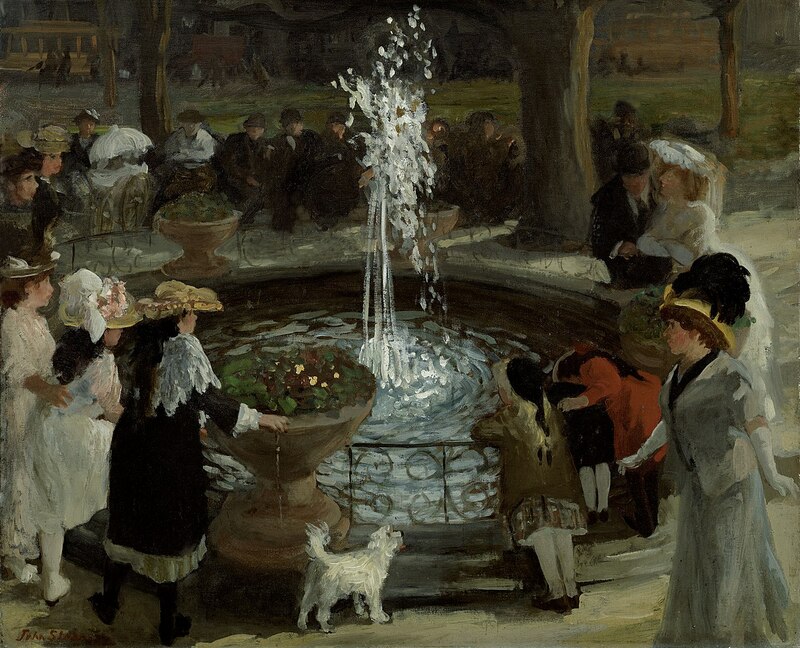 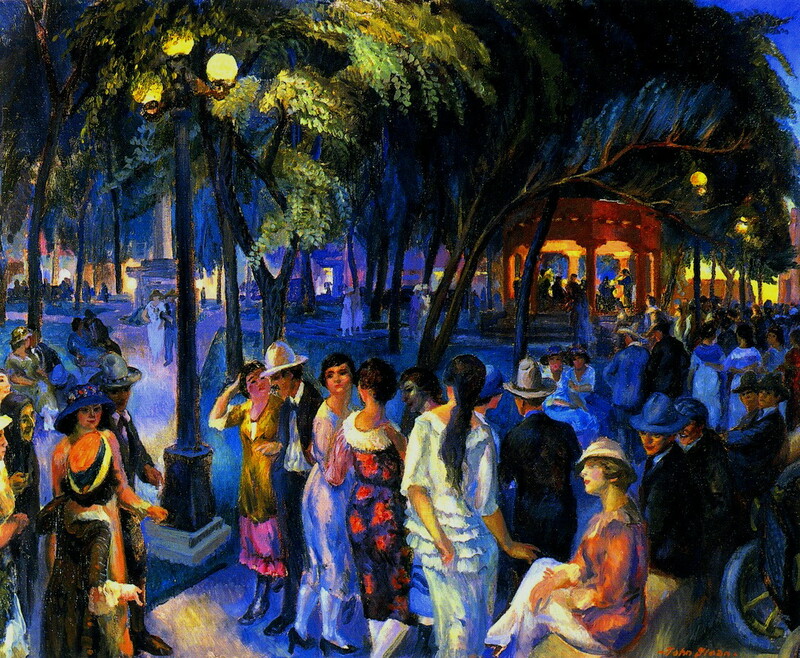 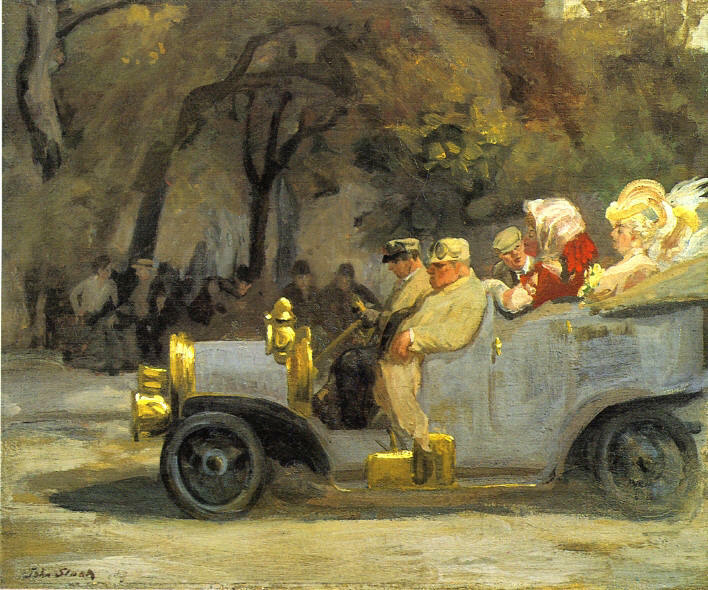 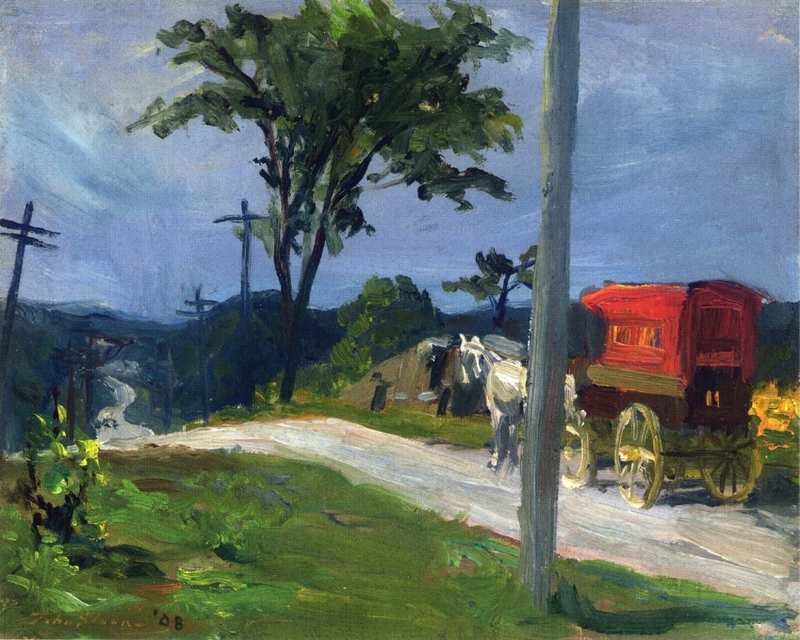 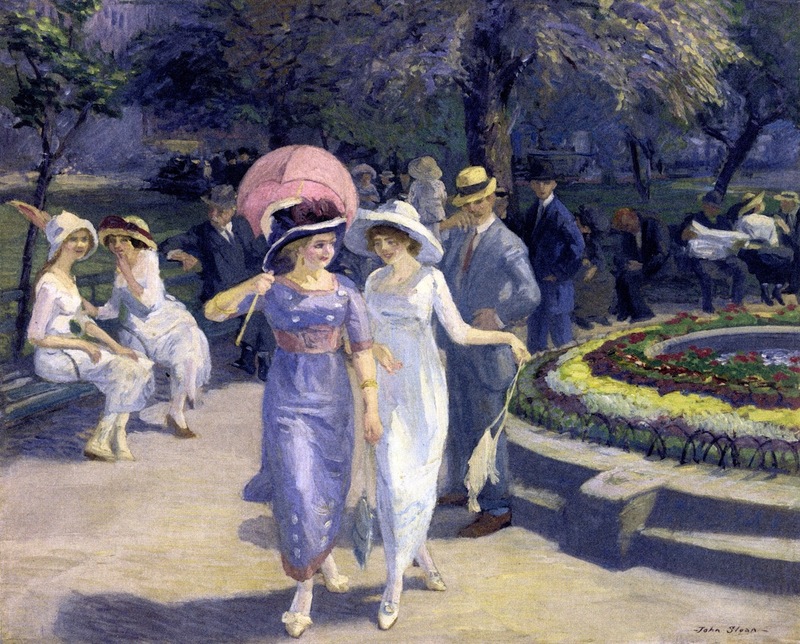 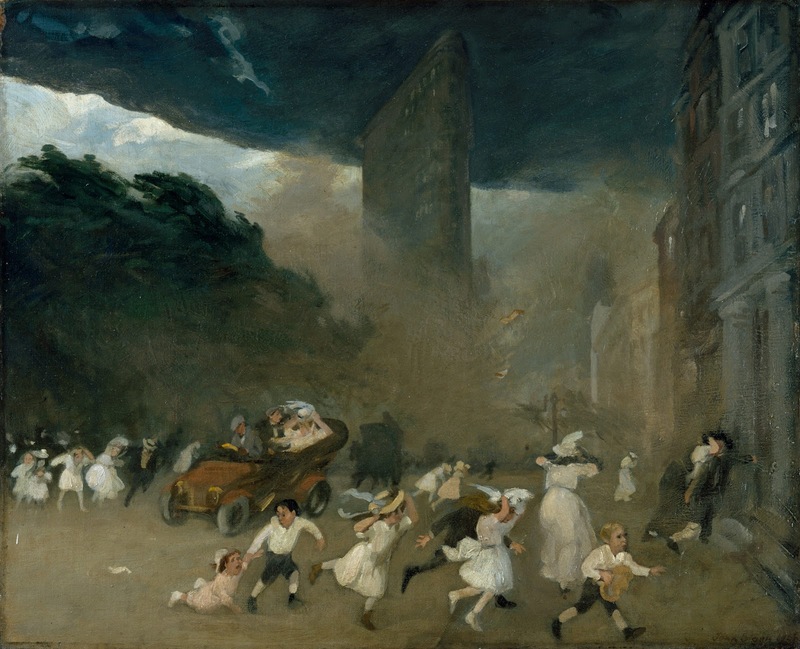 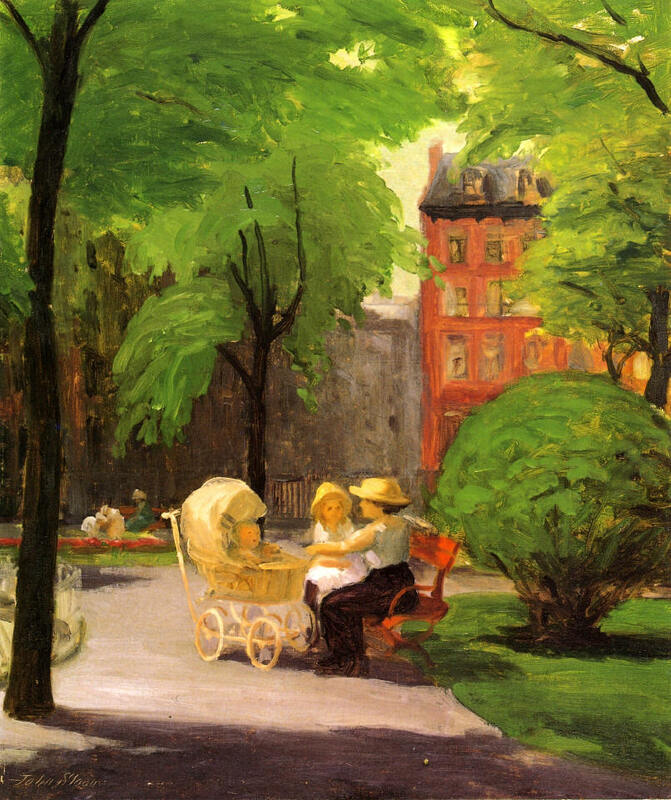 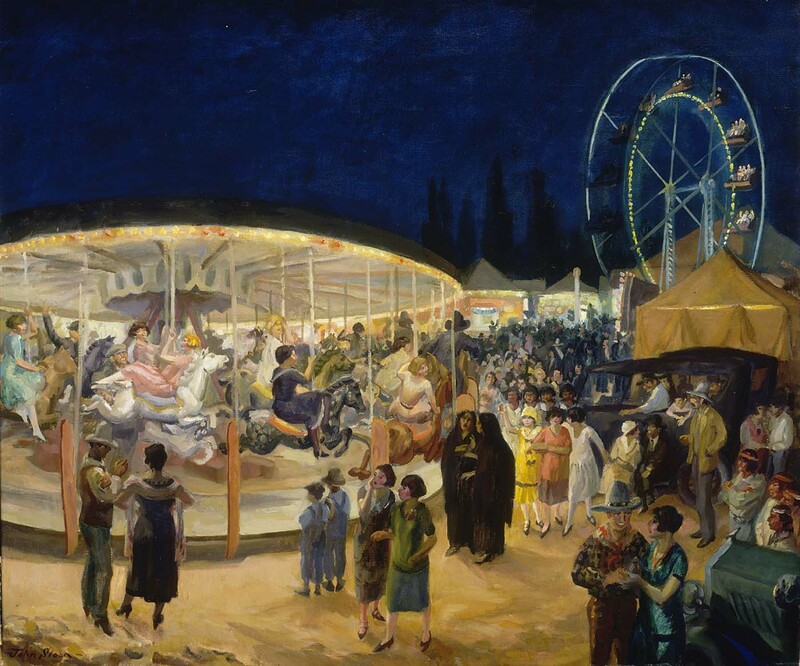 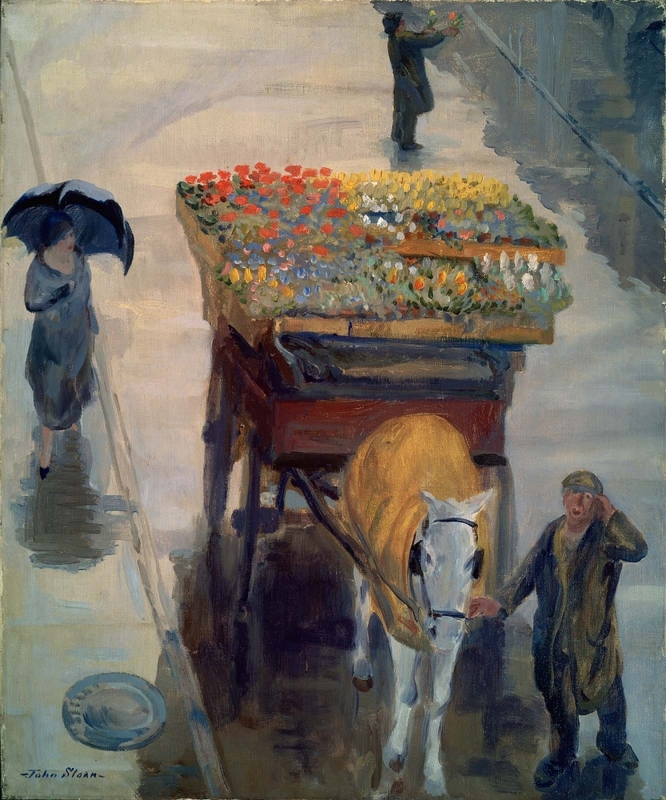 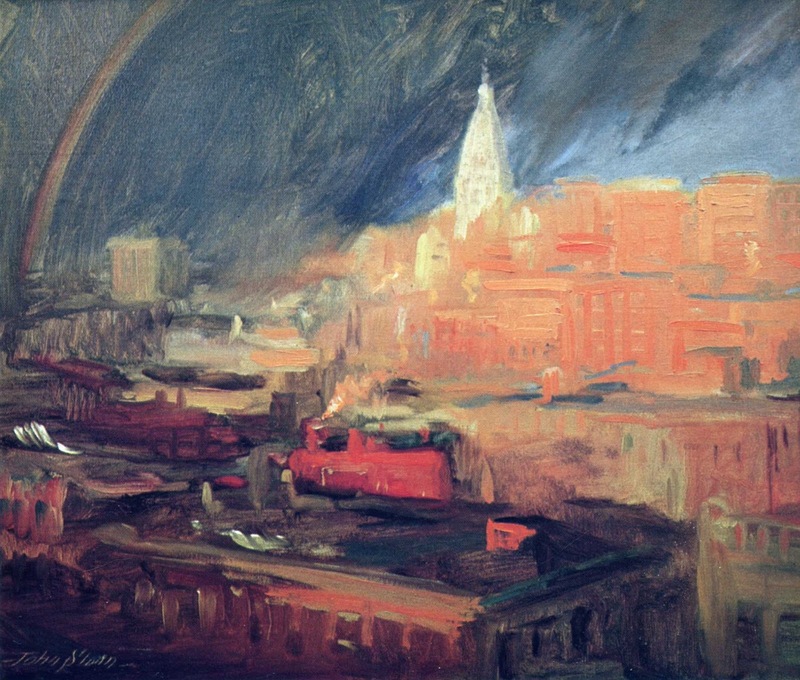 John French Sloan (1871-1951) was born in Lock Haven, Pennsylvania, on August 2, 1871, the son of an amateur artist and occasional businessman. 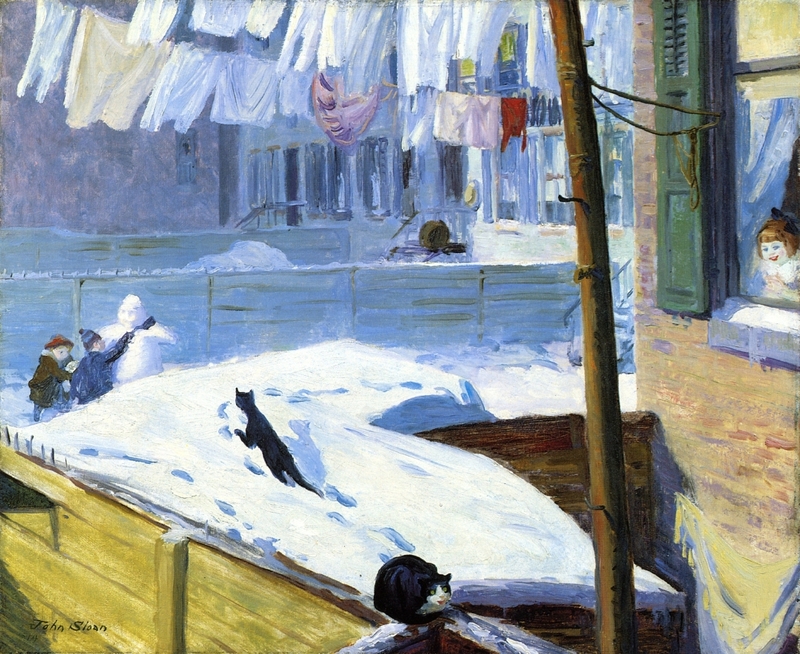 In 1876 he moved with his family to Philadelphia and in 1884 enrolled in Central High School, where William Glackens (American, 1870-1938) ⎆ and Albert Coombs Barnes were among his classmates. 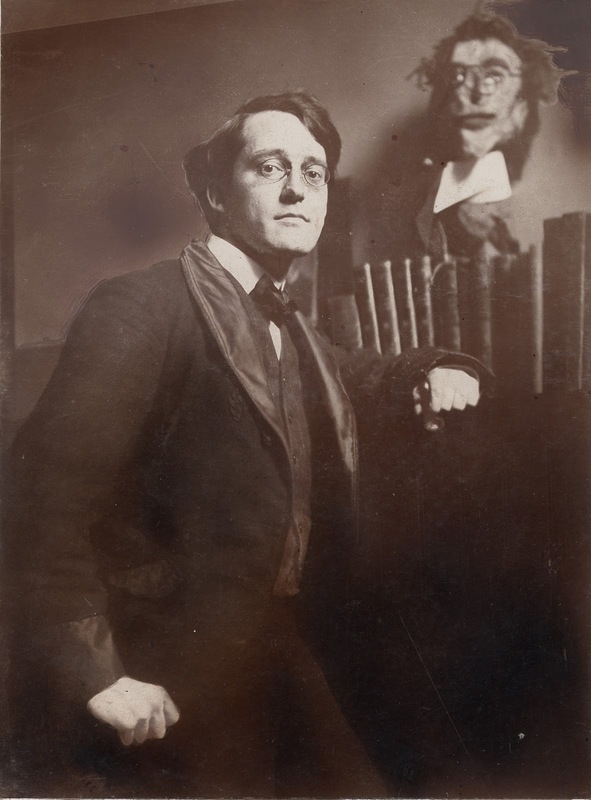 In 1888 he began working for a bookseller and print dealer, and the following year he taught himself how to etch with the aid of Philip Gilbert Hamilton's The Etcher's Handbook. 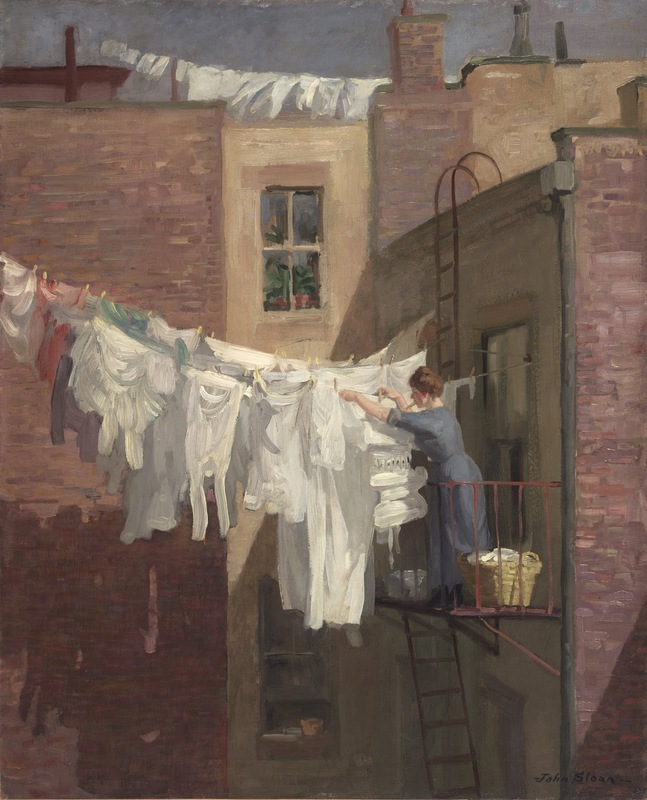 In 1891 Sloan attended drawing classes at the Spring Garden Institute and began to work as a freelance commercial artist. 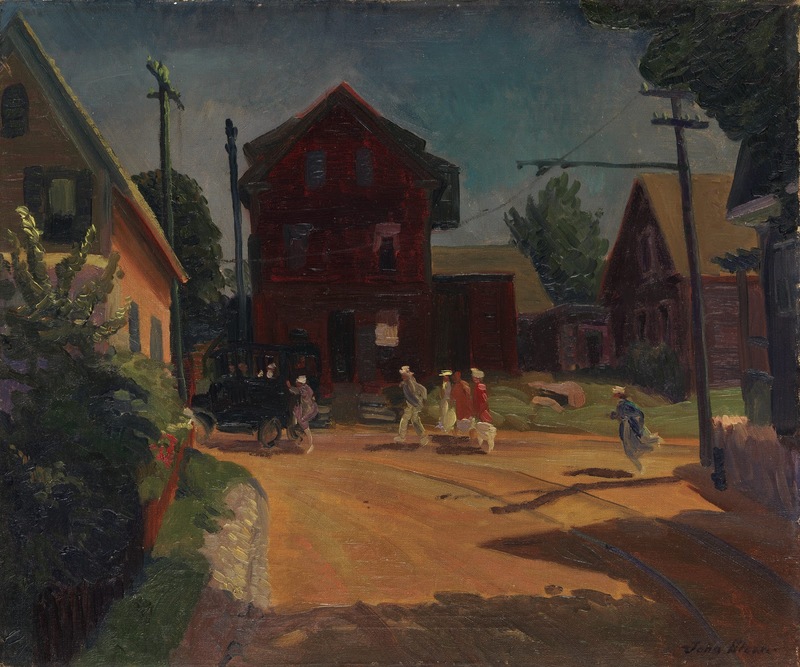 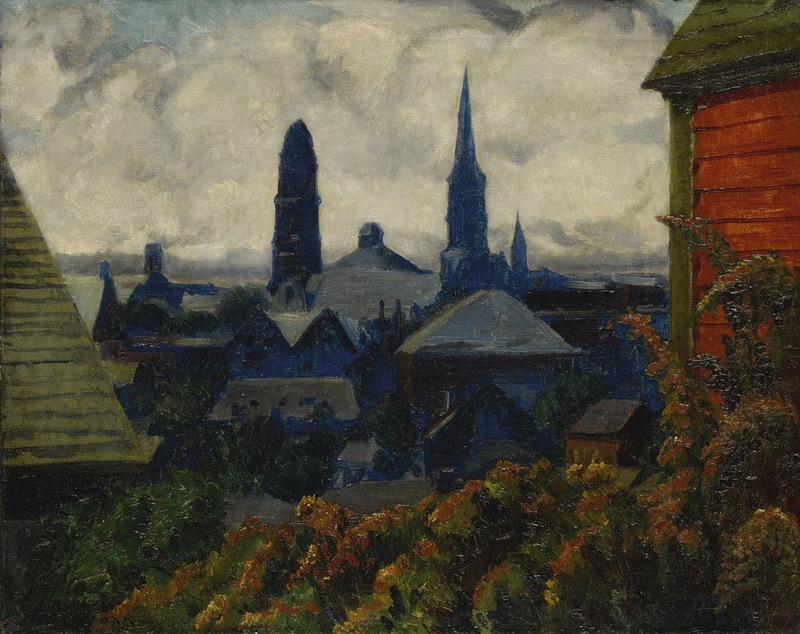 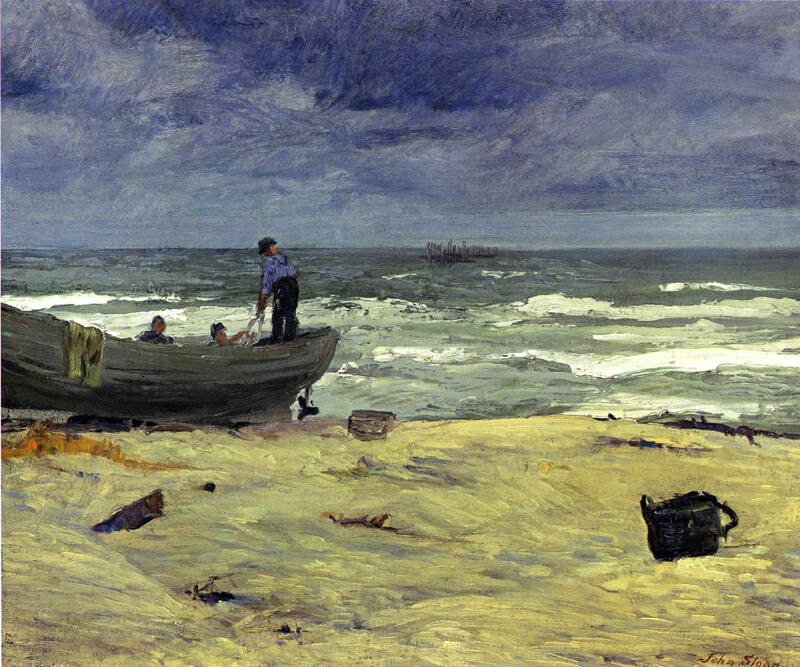 He joined the art department of the Philadelphia Inquirer in 1892, and studied drawing at the Pennsylvania Academy of Fine Arts under Thomas Pollock Anshutz. 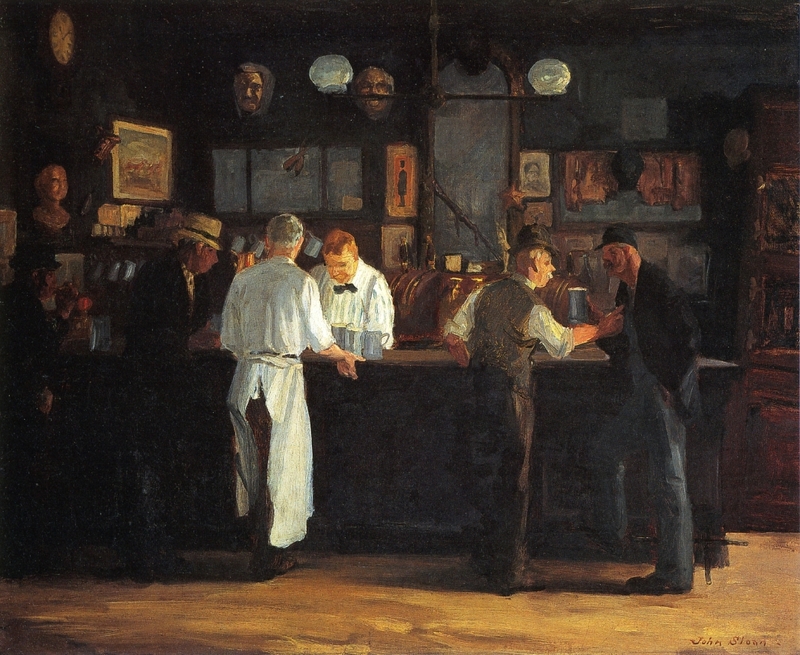 In 1893 he became one of the founders of the Charcoal Club, a group of young artists who broke away from the academy. 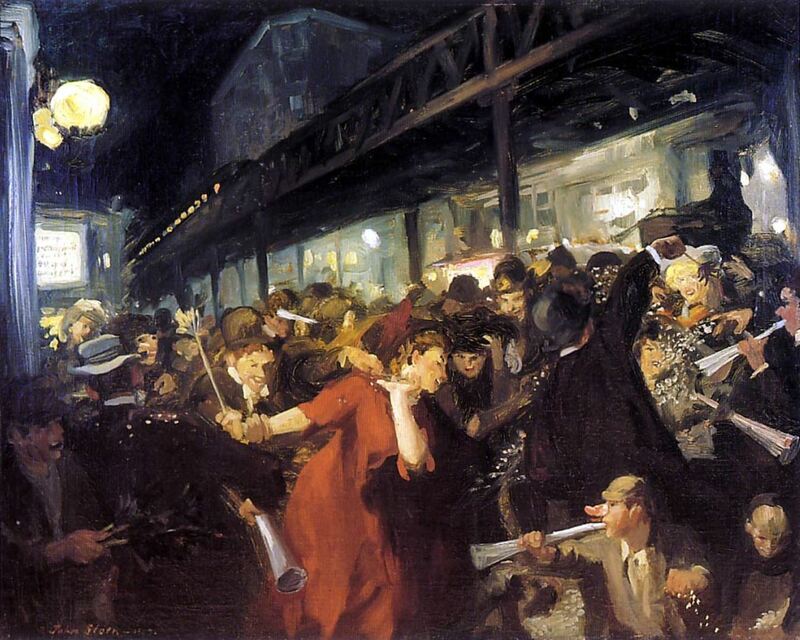 From 1895-1903 he worked for the Philadelphia Press. 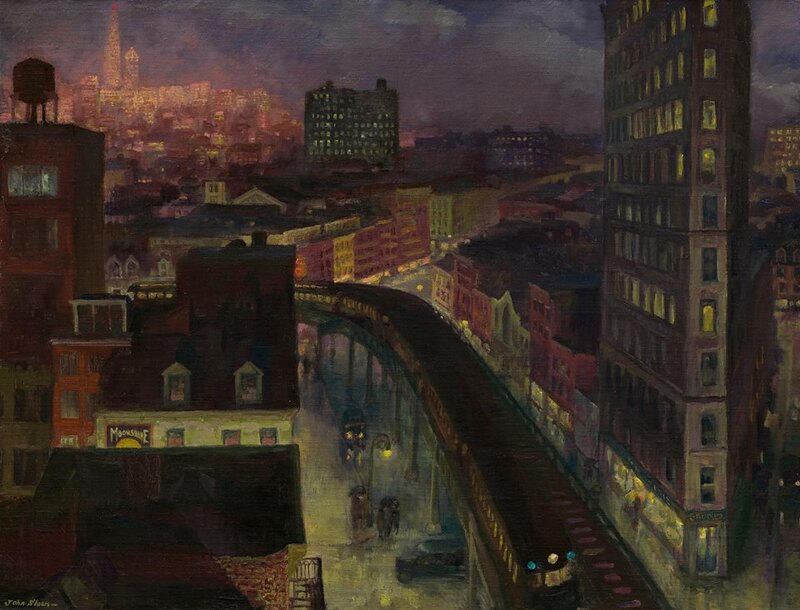 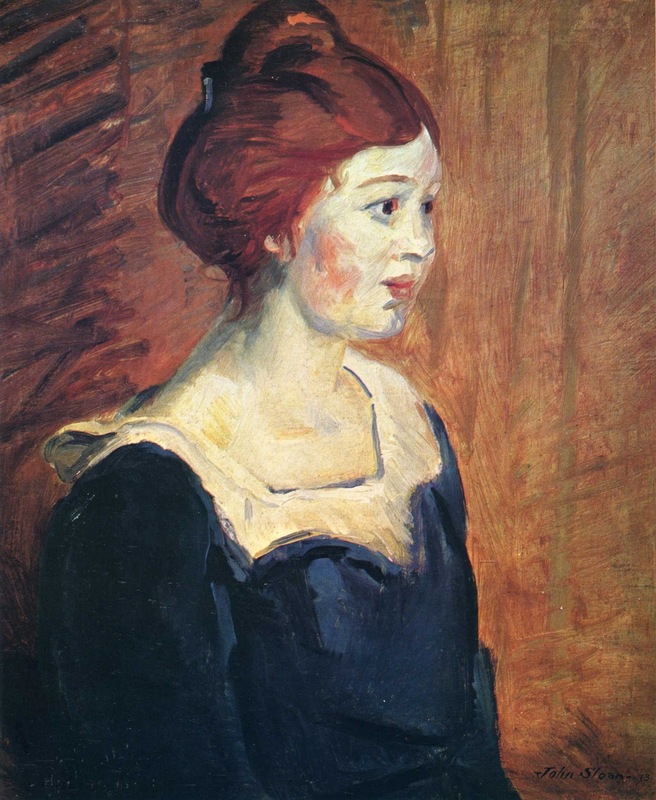 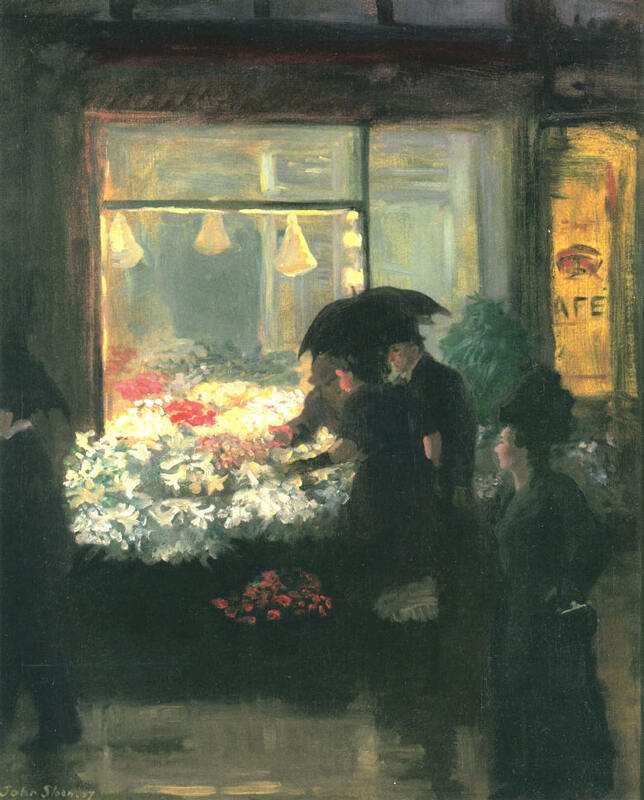 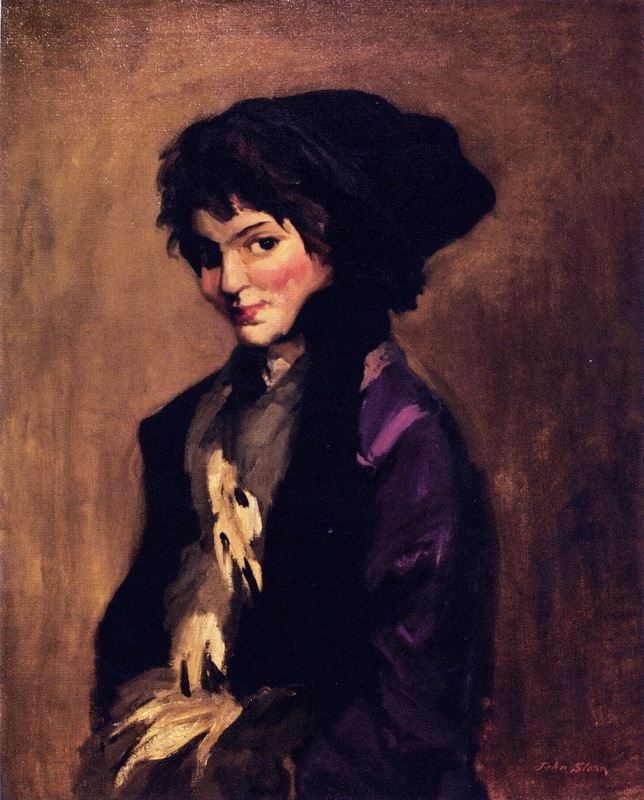 Inspired by Robert Henri (American, 1865-1929) ⎆, Sloan started to paint in the late 1890s, beginning with portraits and Philadelphia city scenes. 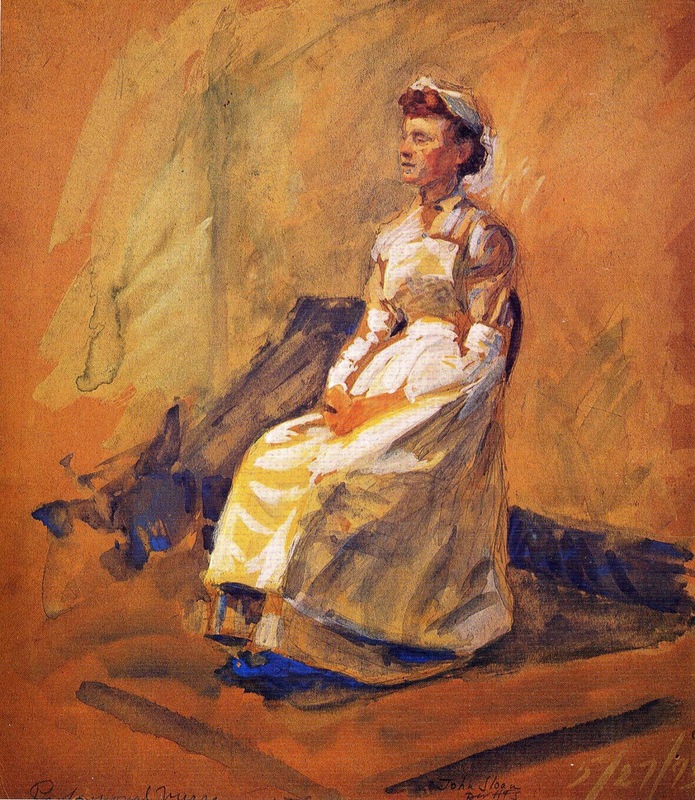 He exhibited for the first time at the Pennsylvania Academy in 1900. 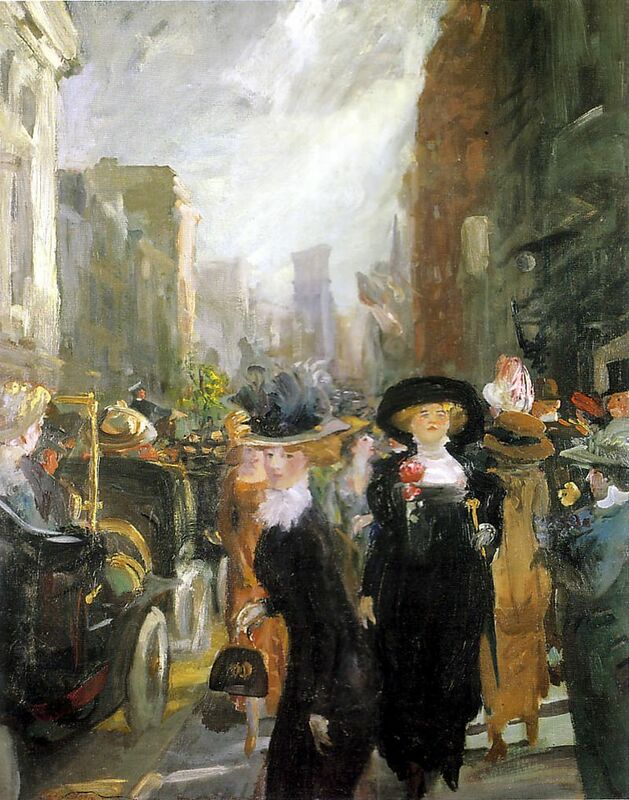 Sloan married Anna Maria Wall, known as Dolly, in 1901, and in 1904 they moved to New York City. 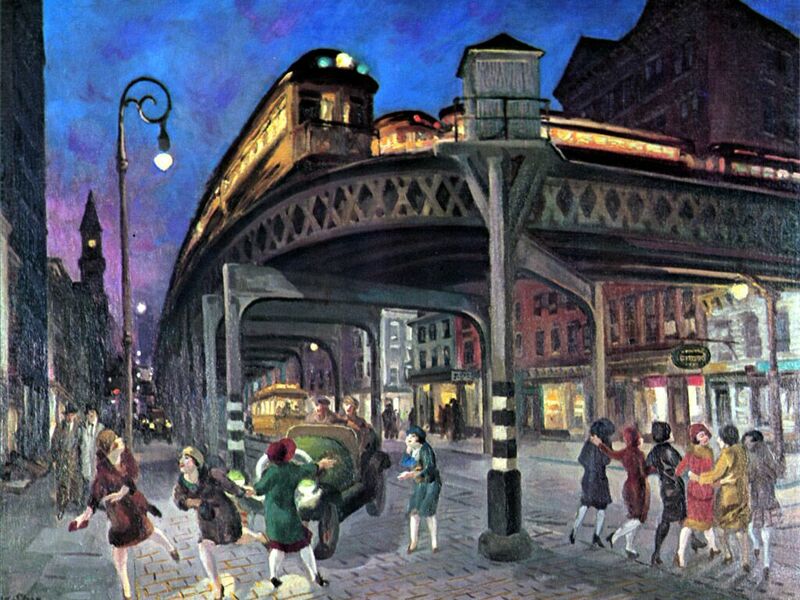 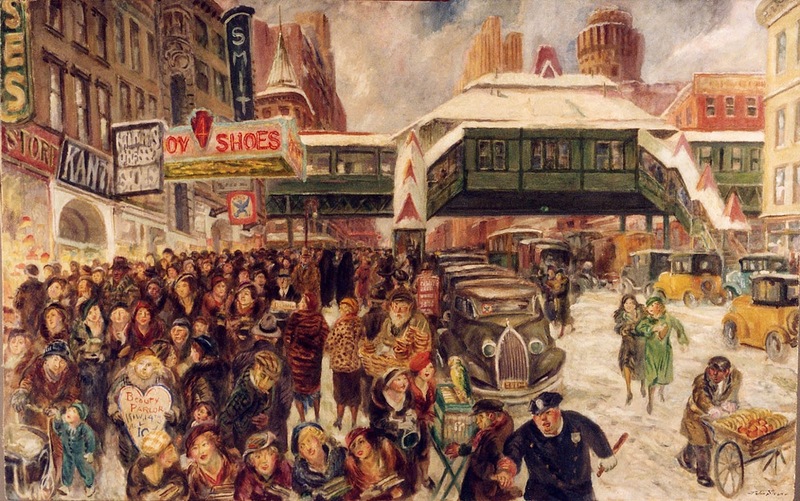 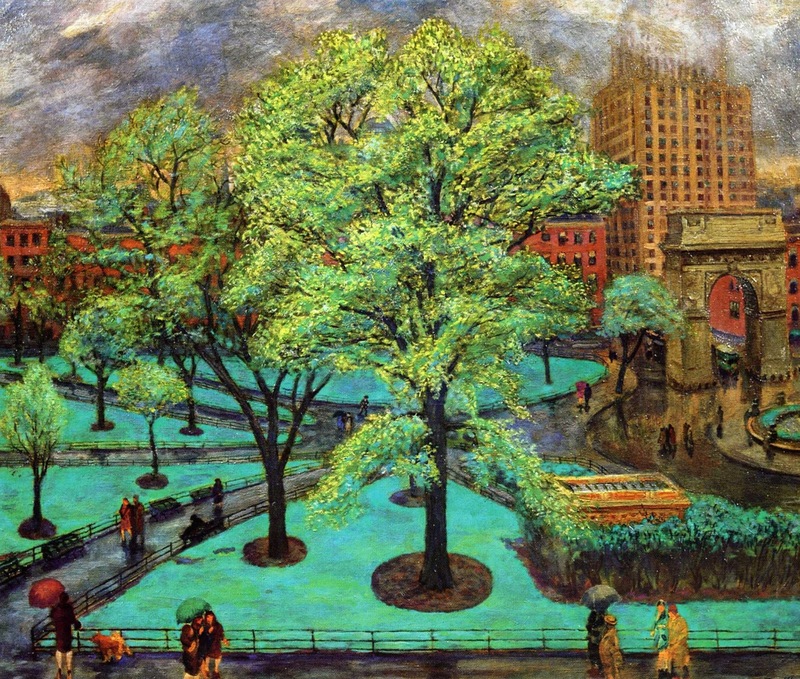 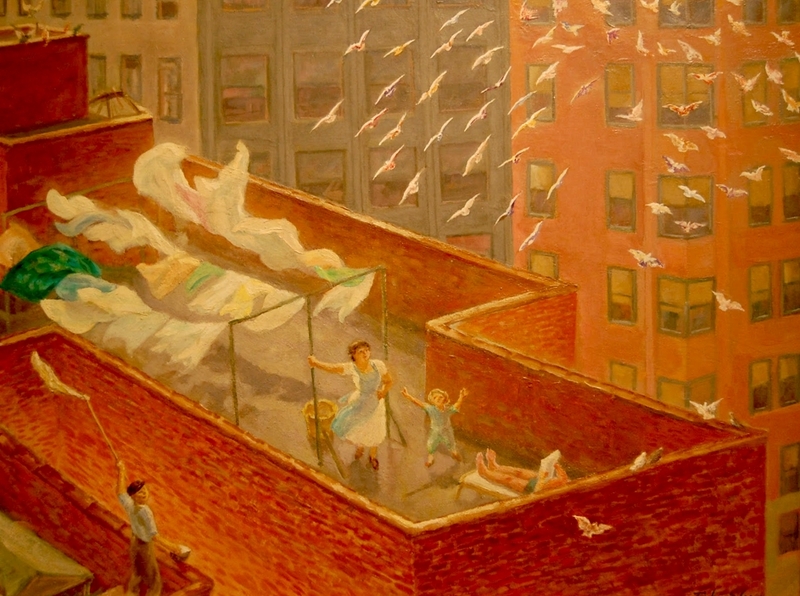 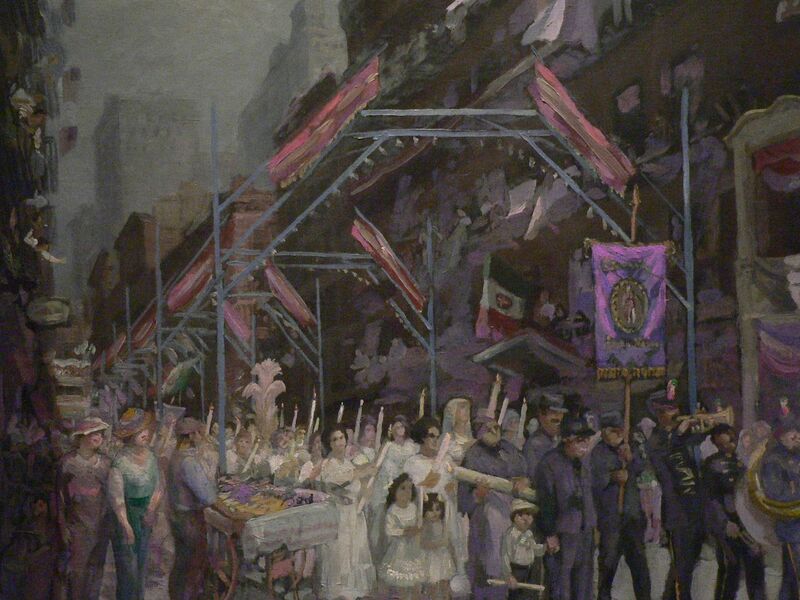 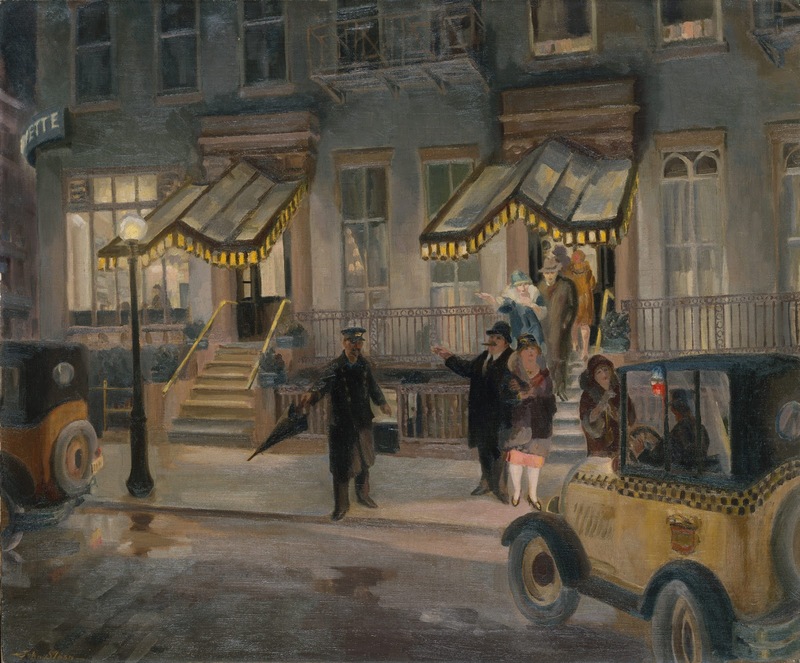 He painted realistic scenes of Greenwich Village and the Tenderloin district and continued to work as a freelance illustrator. 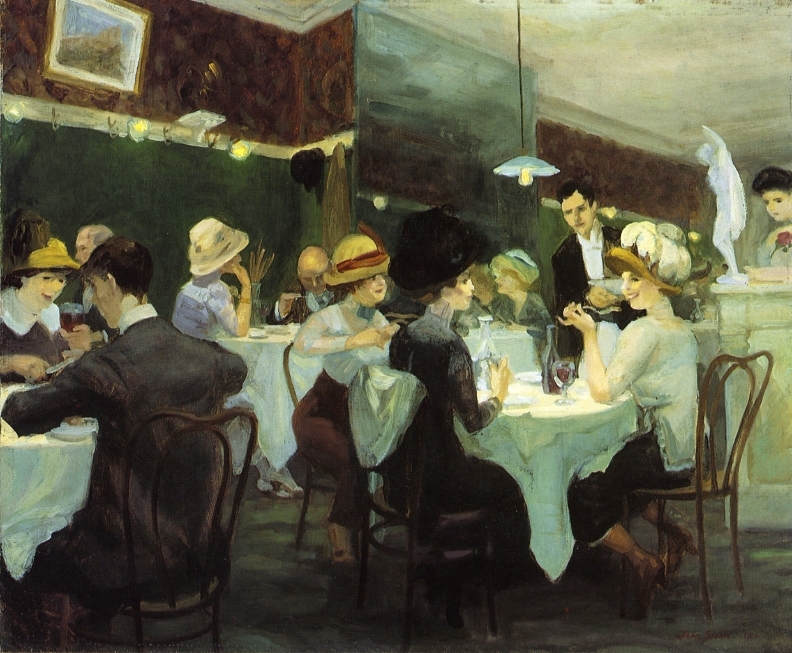 In 1908 he participated in the historic exhibition of The Eight at Macbeth Gallery. 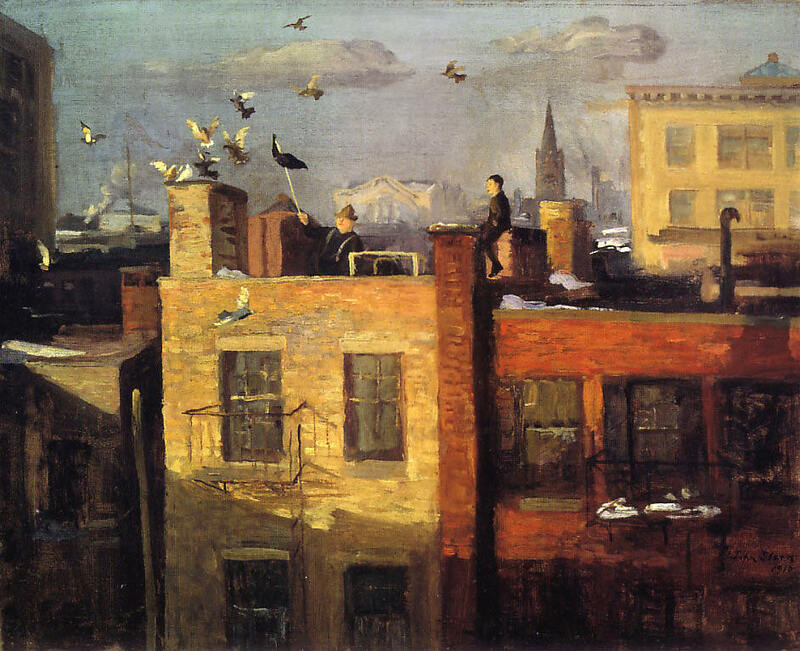 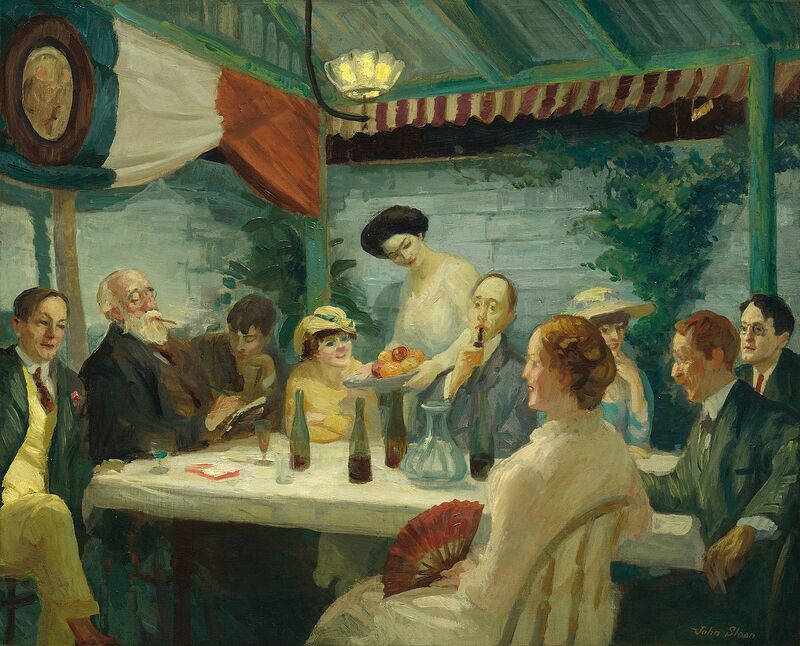 Sloan came to be regarded as a central figure in the Ashcan school ⎆ and was noted for his painterly style and dark palette. 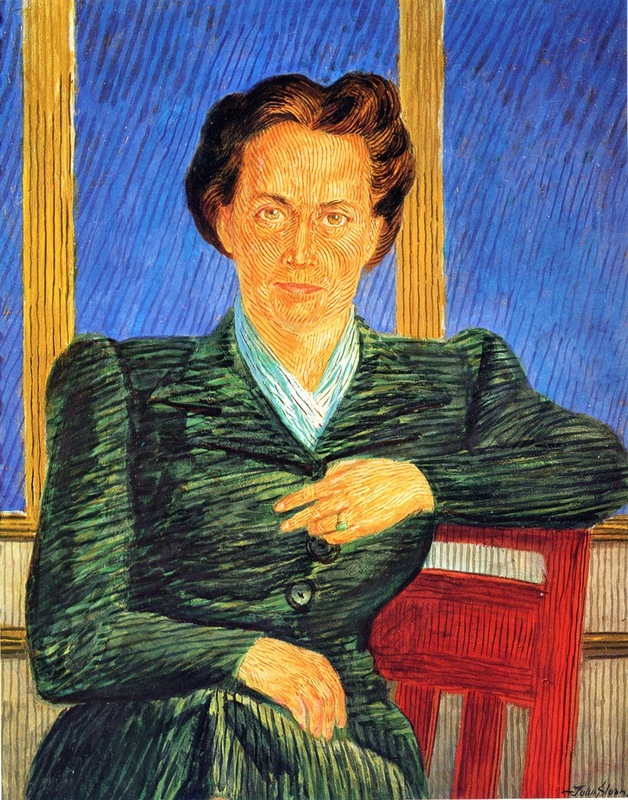 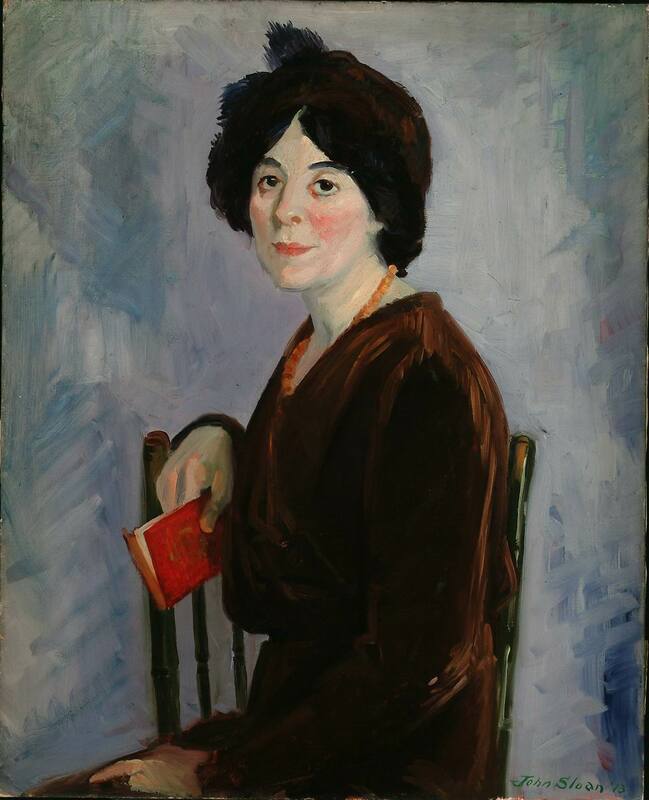 In 1910 he helped organize the Exhibition of Independent Artists and also joined the Socialist Party. 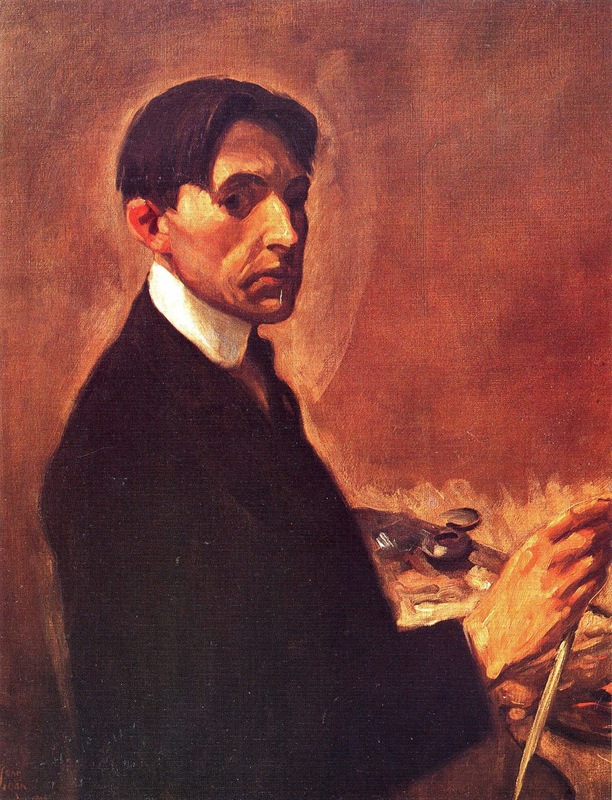 From 1912-1916 he was art director for the radical publication The Masses, and he remained committed to left-wing causes throughout his life. 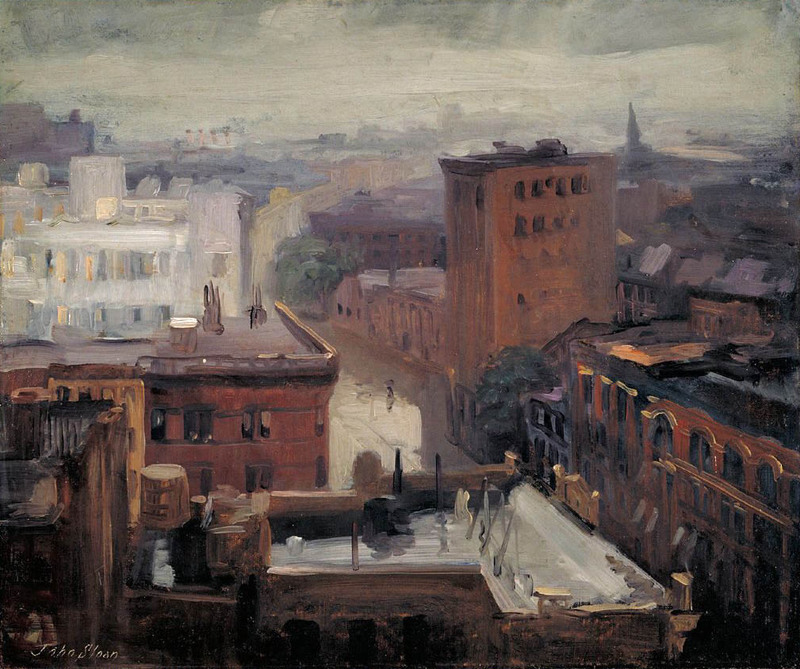 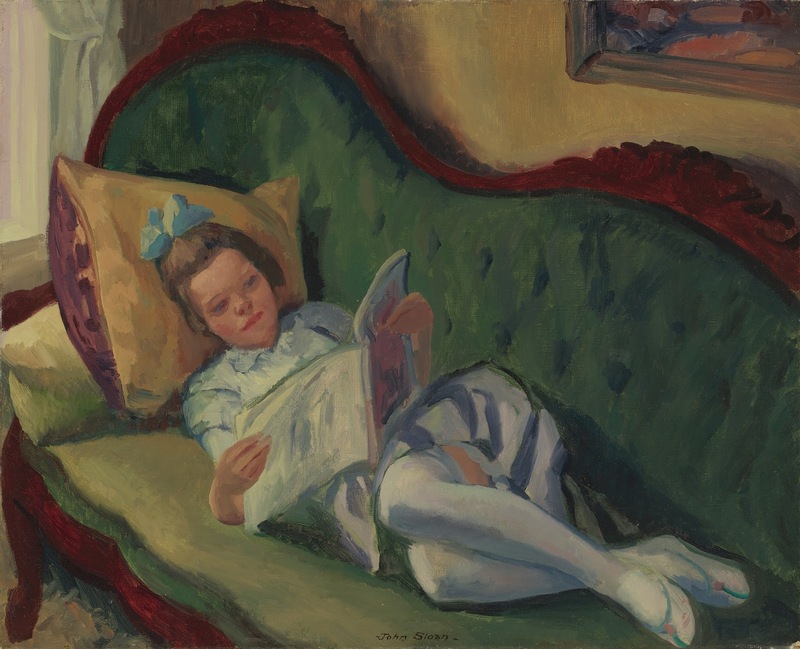 Sloan participated in the Armory Show in 1913, exhibiting two oils and five etchings. 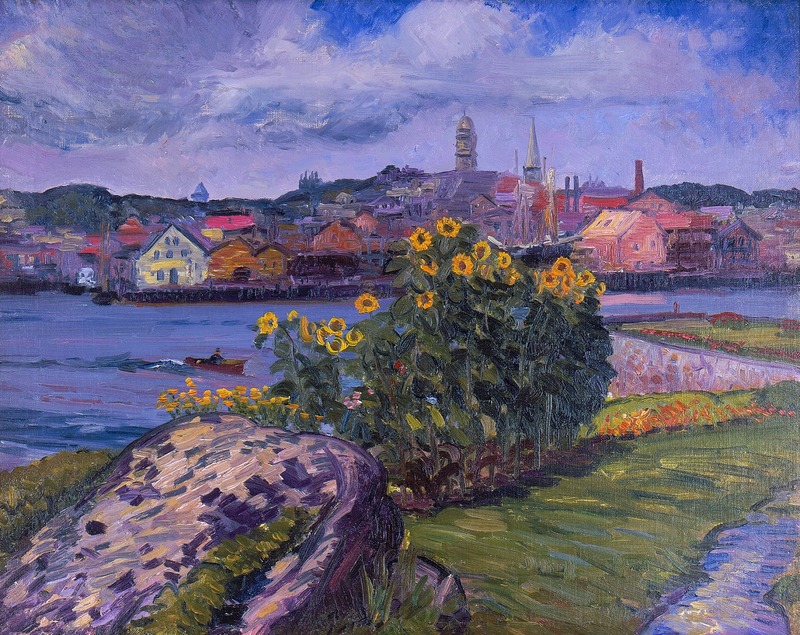 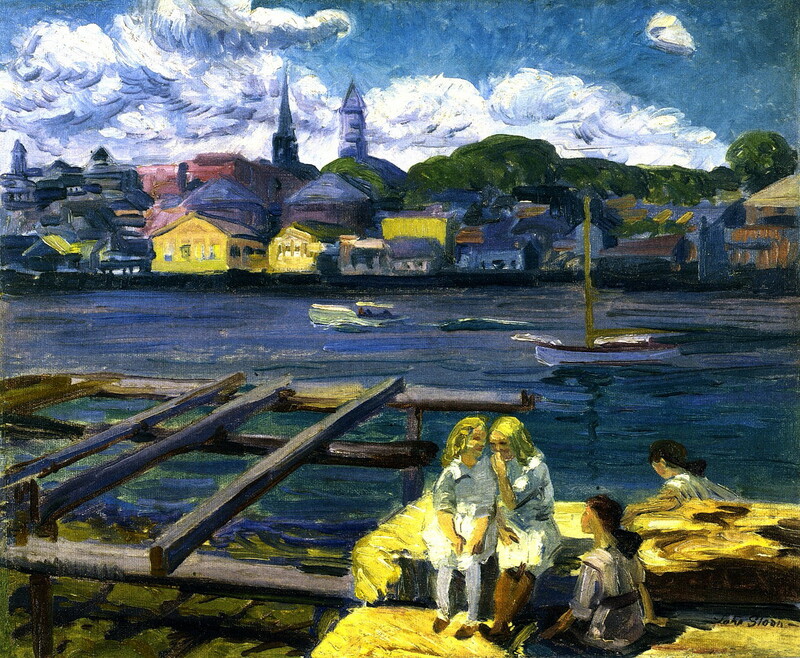 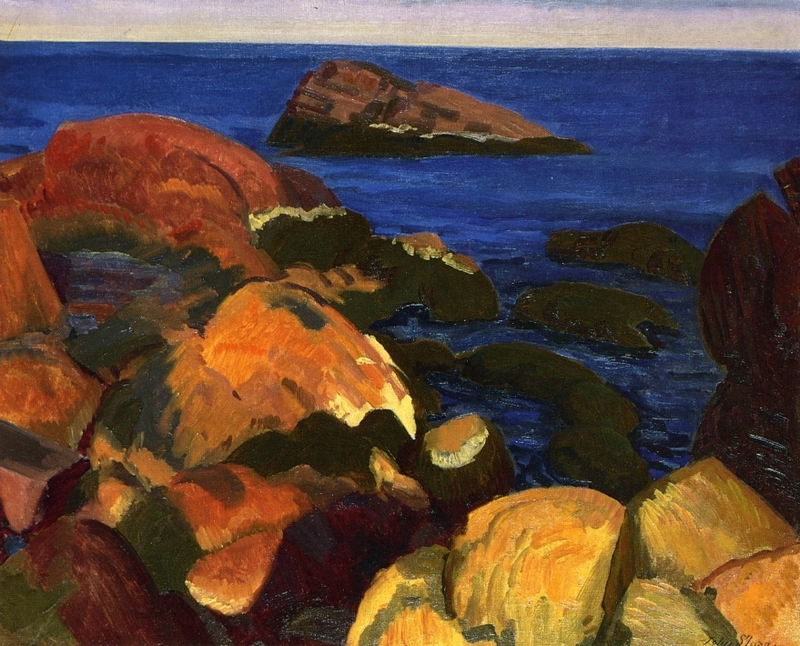 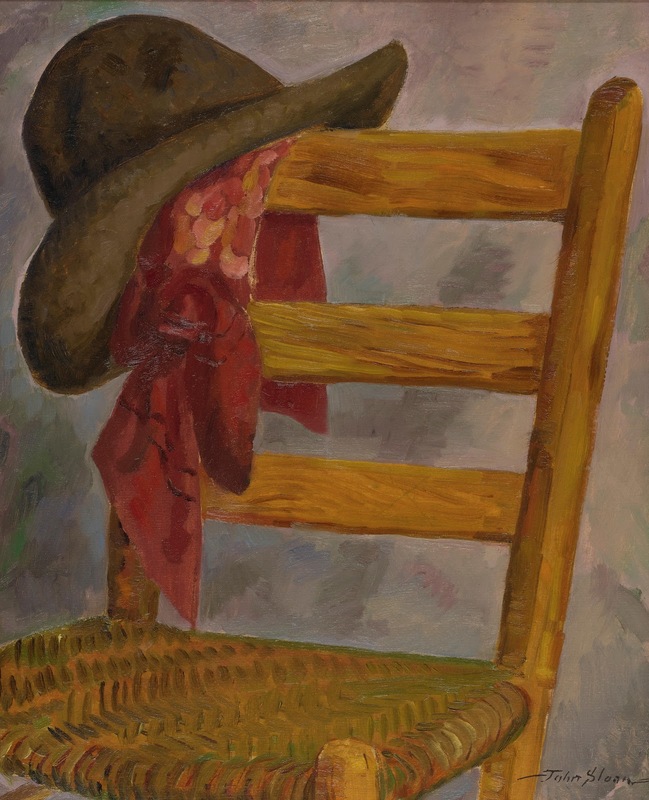 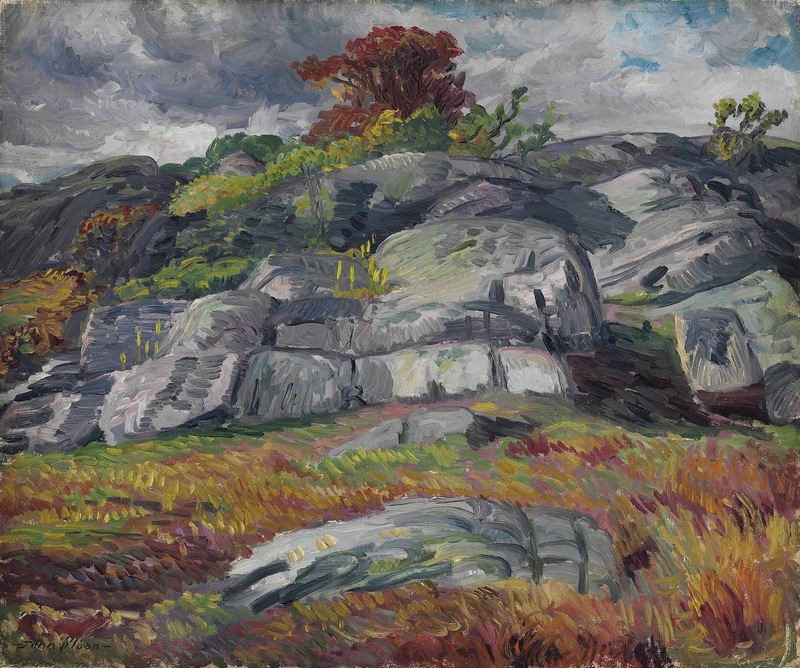 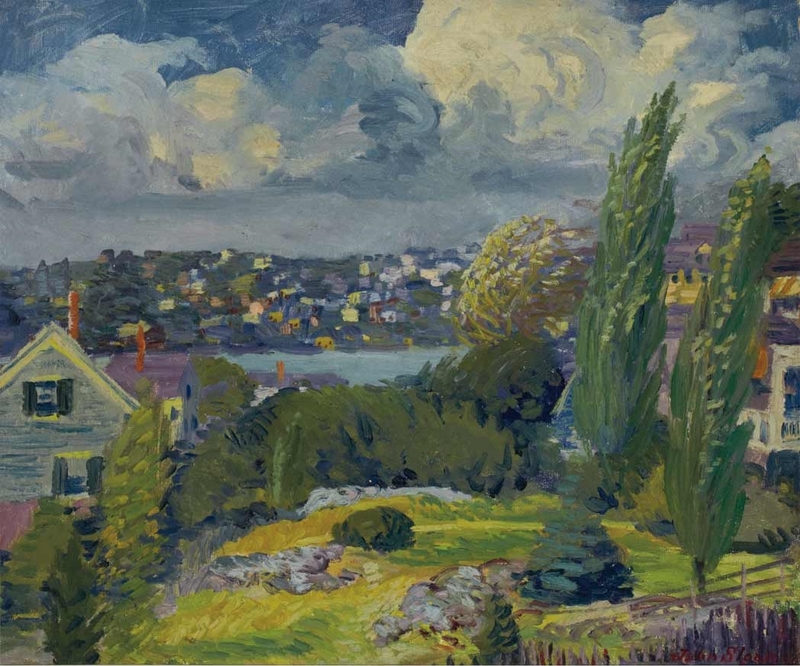 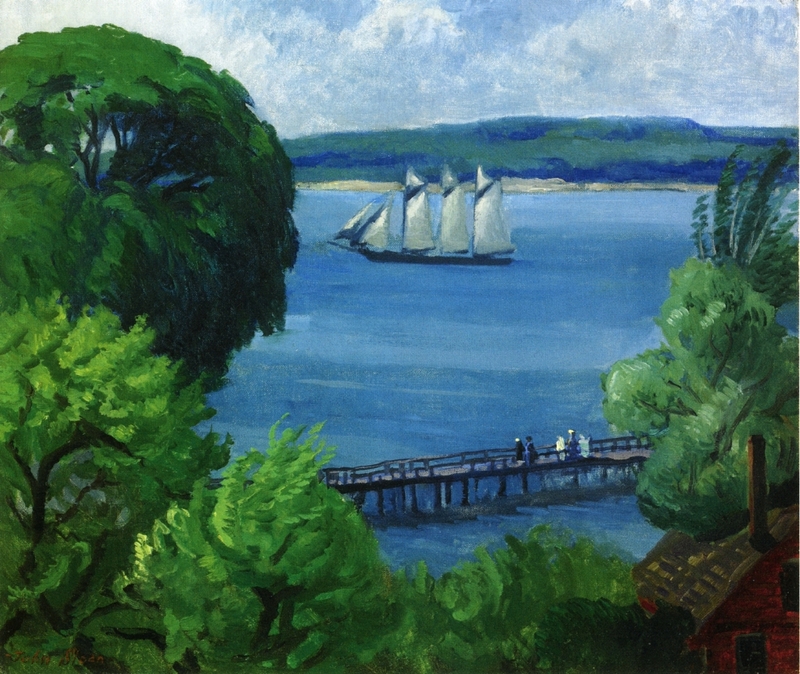 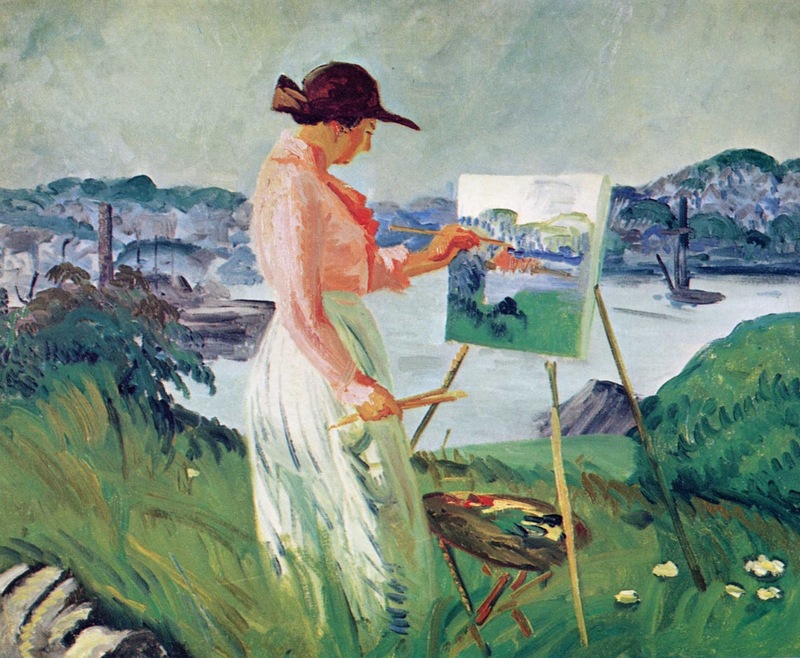 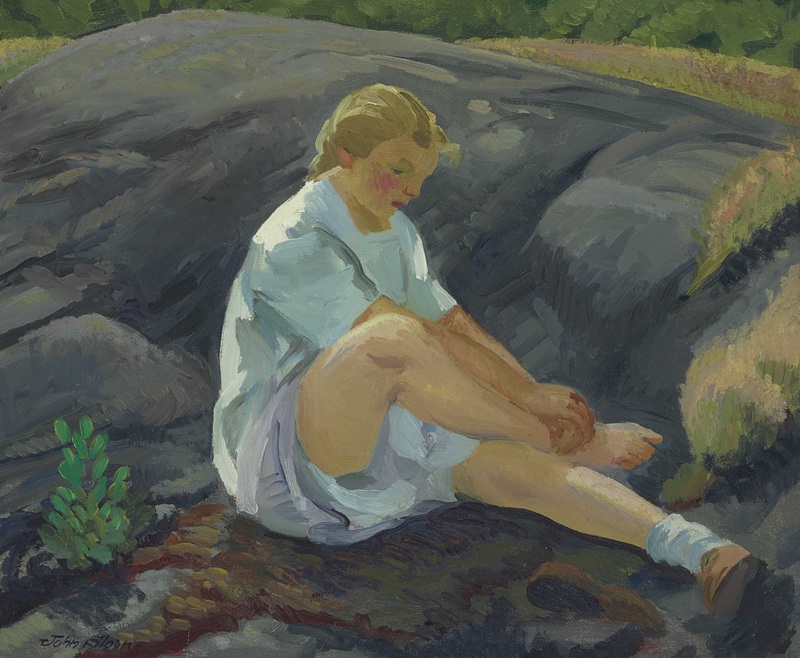 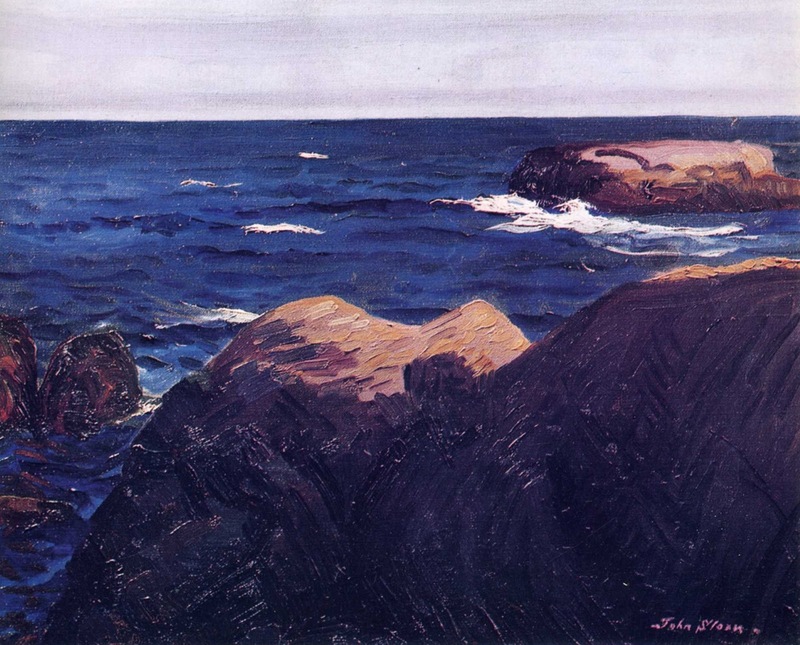 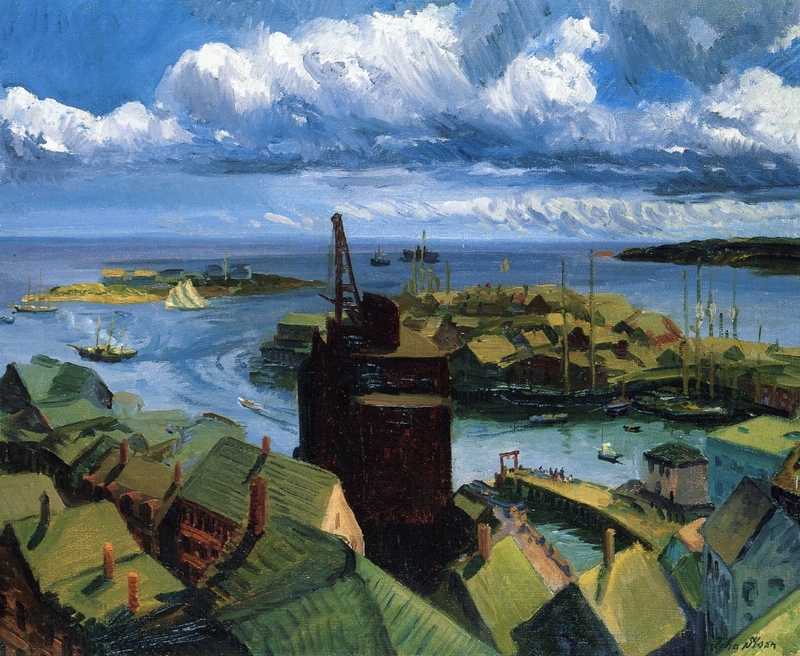 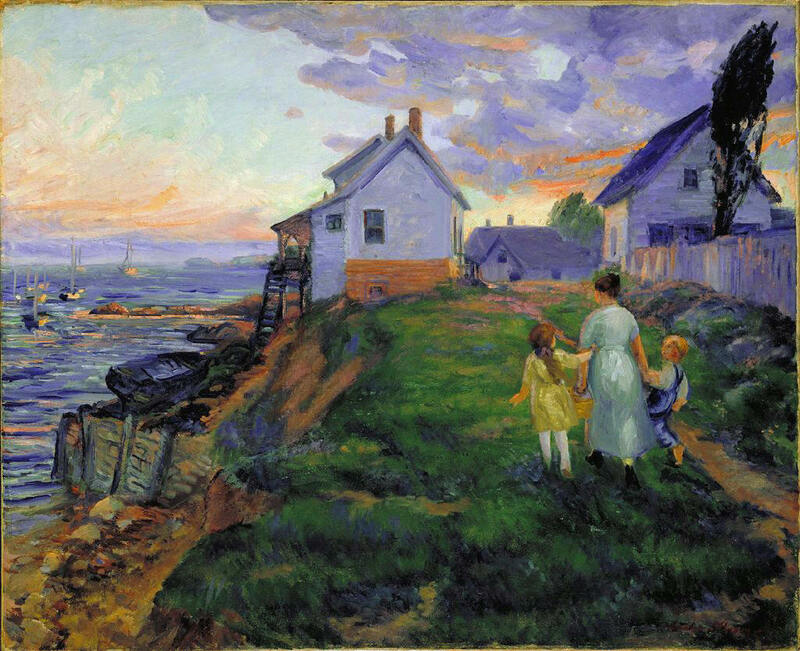 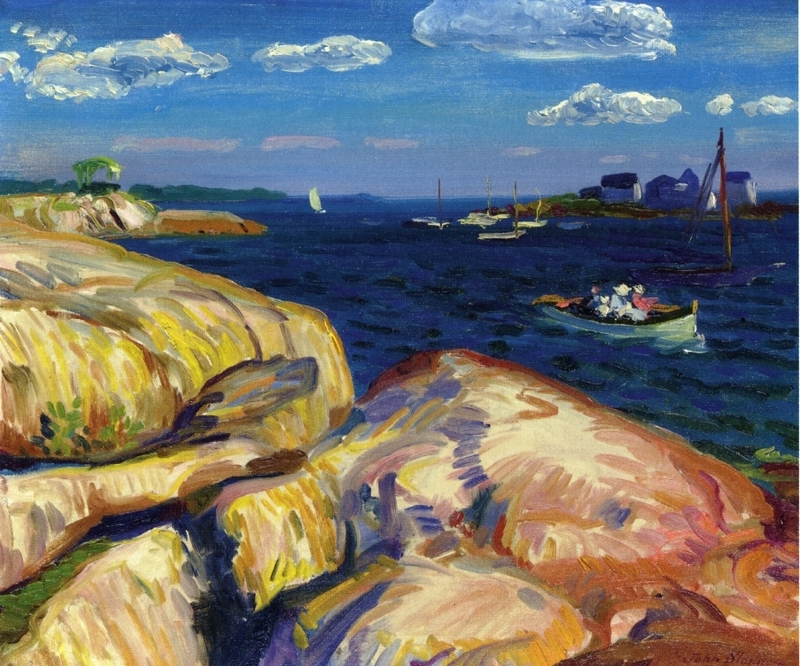 The postimpressionist and fauve works that he saw at the exhibition influenced his style and choice of subject matter, and while summering in Gloucester, Massachusetts, during the middle teens he painted colorful landscapes using a bright fauvist palette. 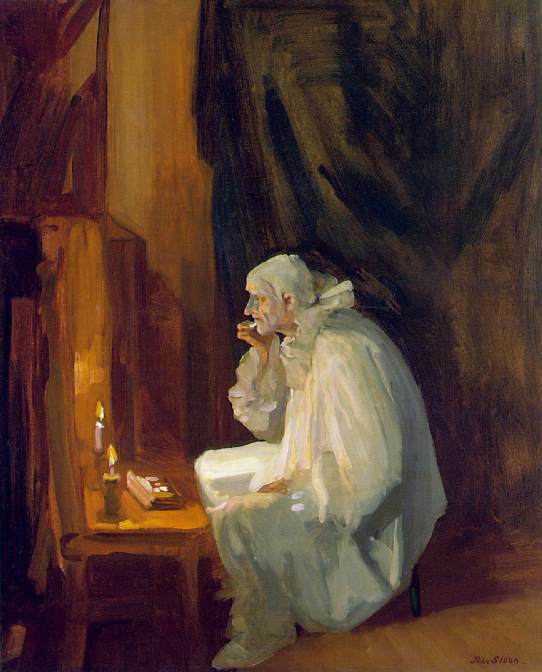 Sloan professed admiration for Picasso ⎆ and, while being careful to avoid imitating the new European styles, remained open to them. 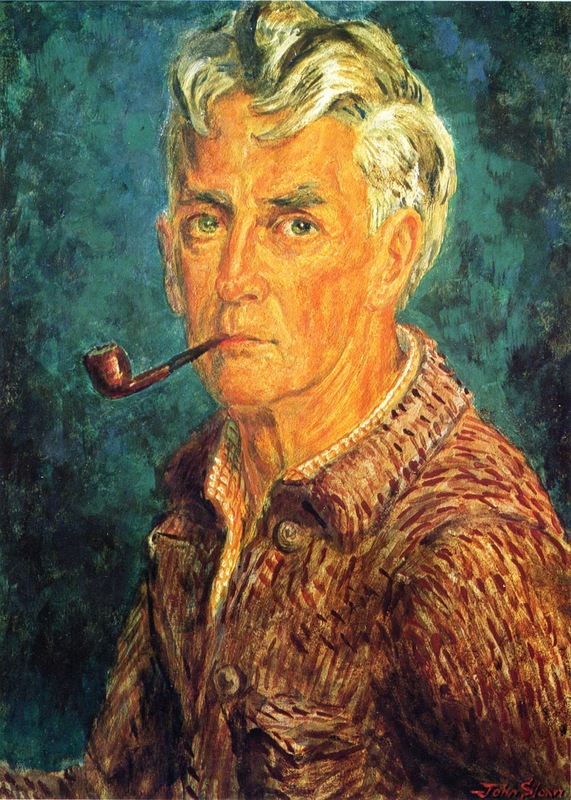 Sloan began teaching at the Art Students League in 1914 and became a respected teacher; among his students were Alexander Calder (American, 1898-1976), David Smith (American, 1906-1965), Reginald Marsh and Barnett Newman (American, 1905-1970). 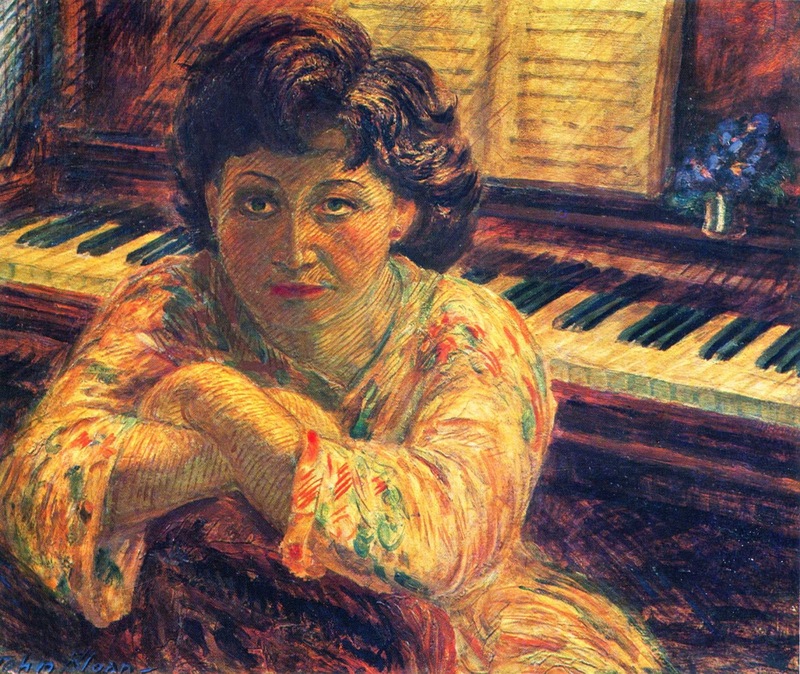 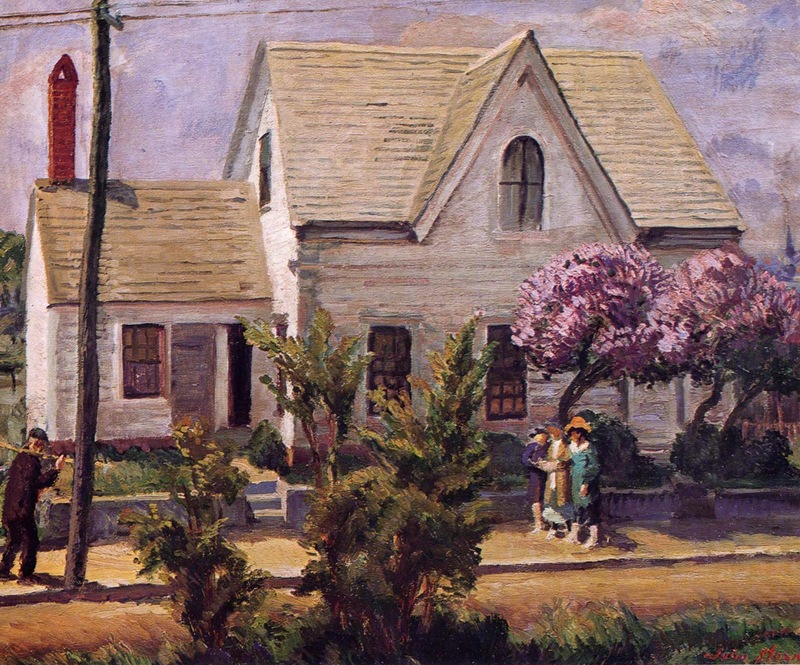 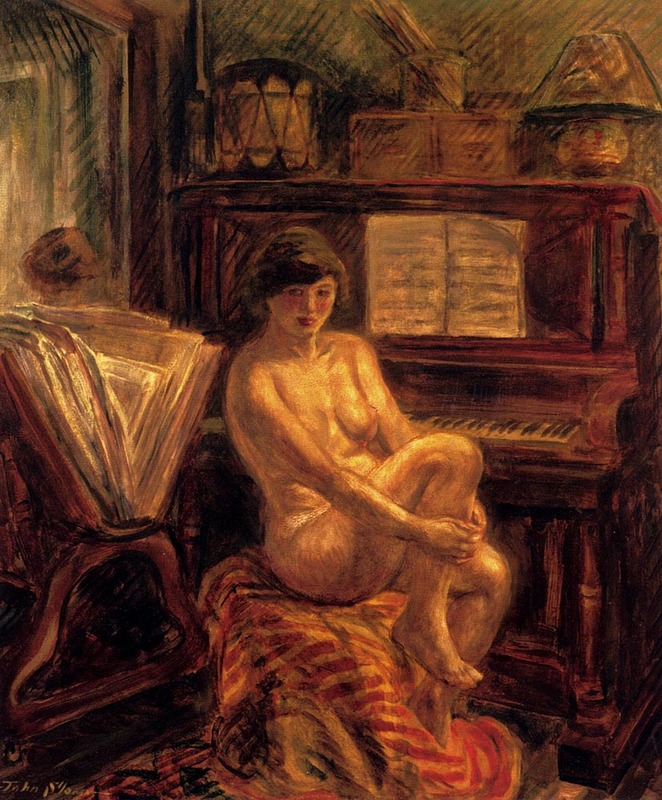 In 1918 he became president of the Society of Independent Artists. 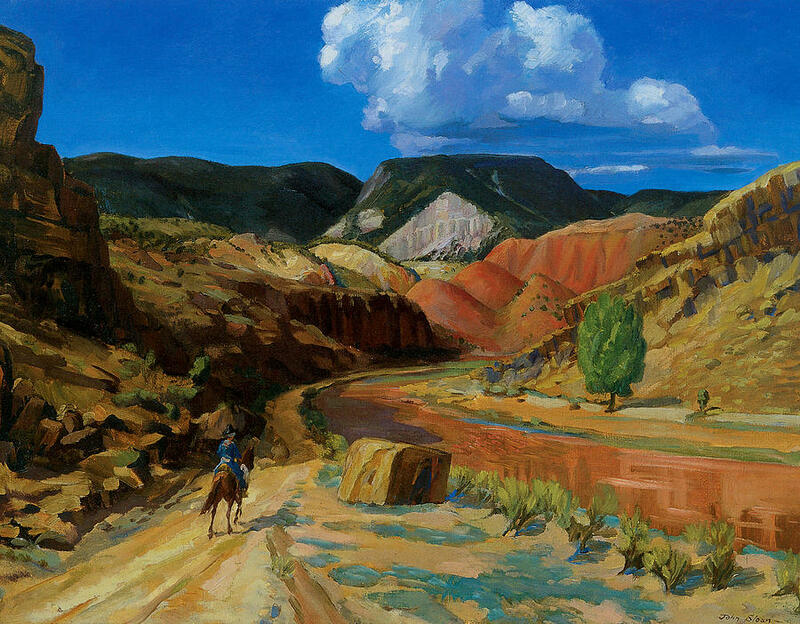 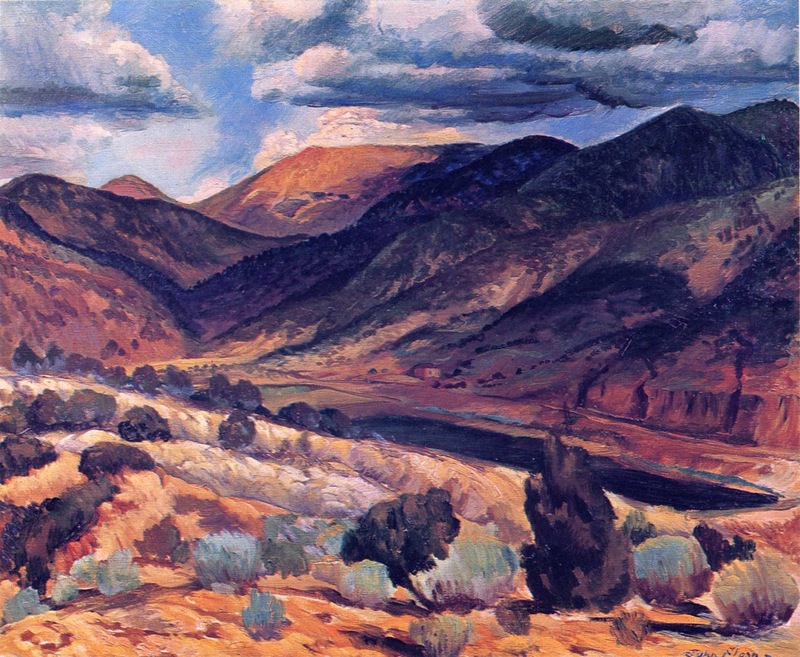 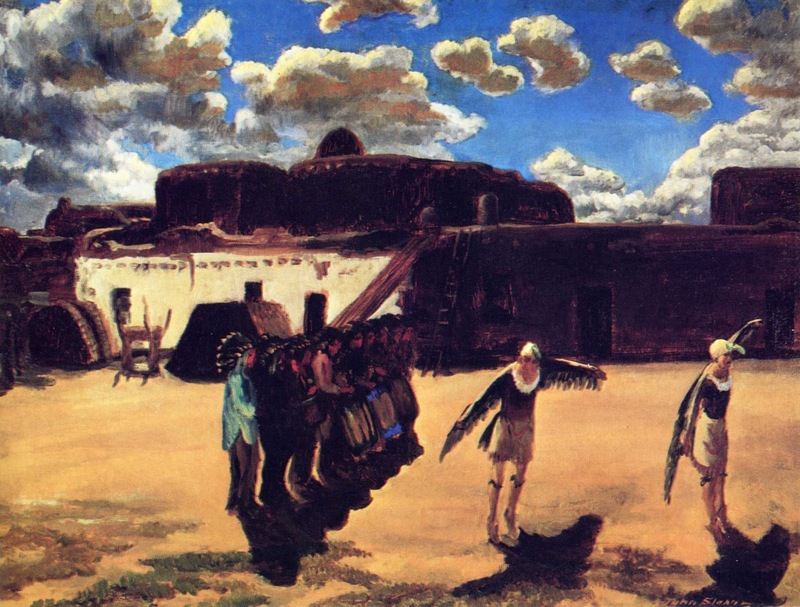 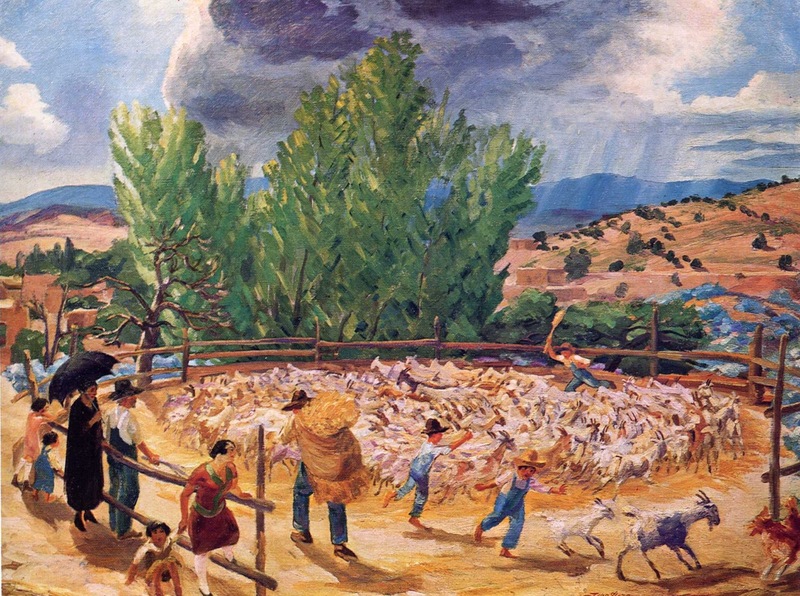 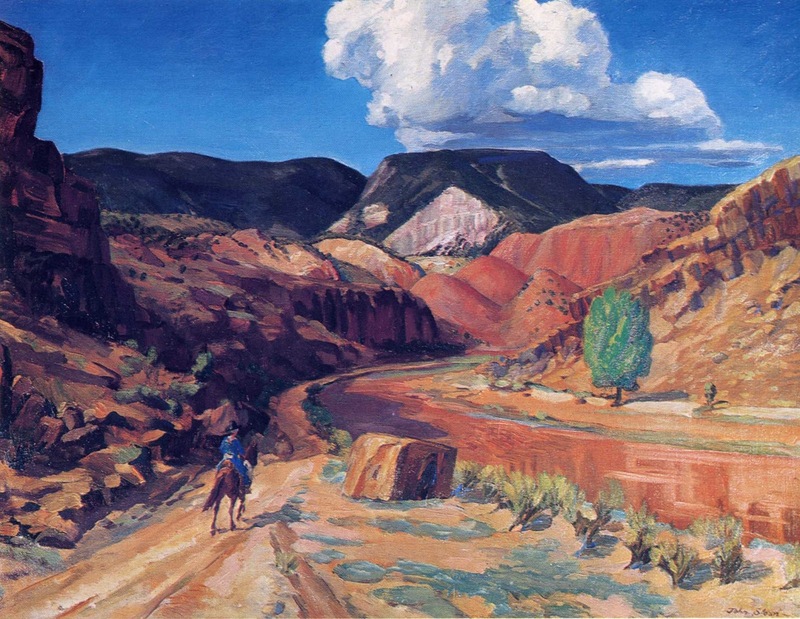 Beginning in 1919 he spent summers in Santa Fe, New Mexico, where he encountered Native American art and the Mexican muralists Diego Rivera ⎆ (Mexican, 1886-1957) and José Clemente Orozco (Mexican, 1883-1949). 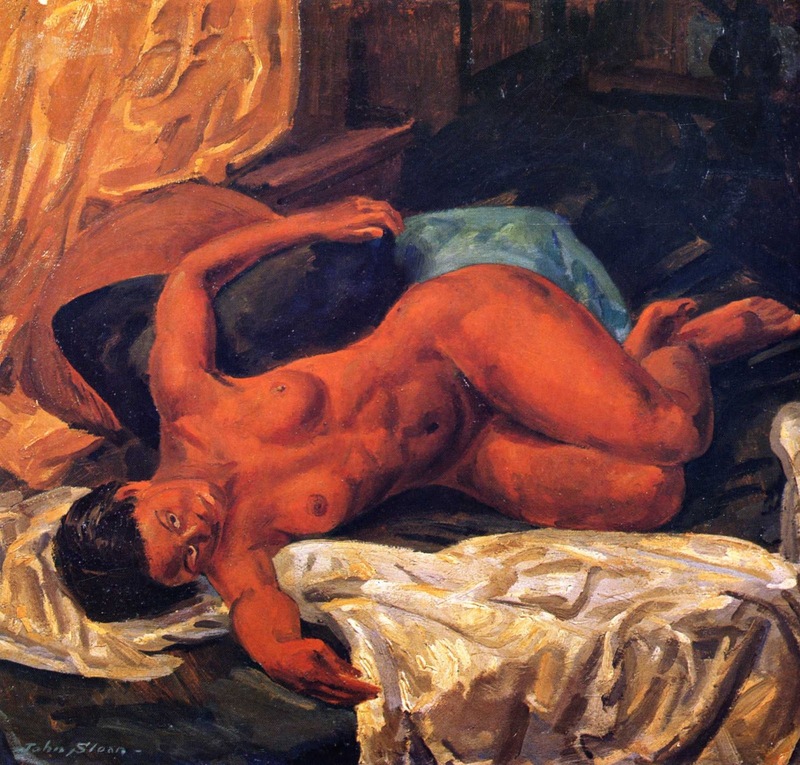 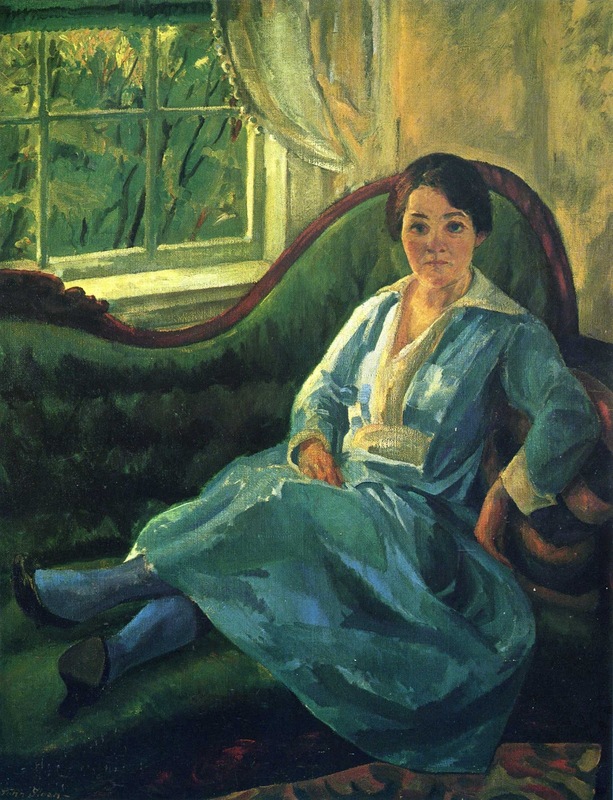 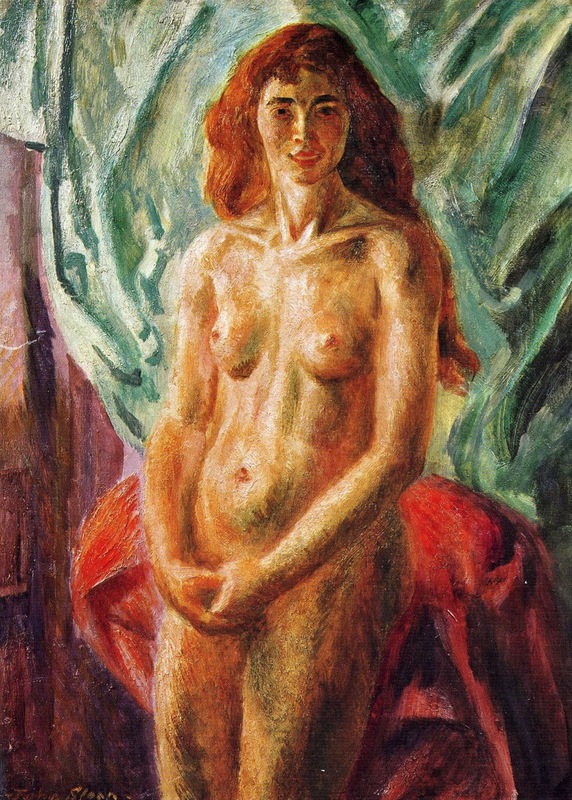 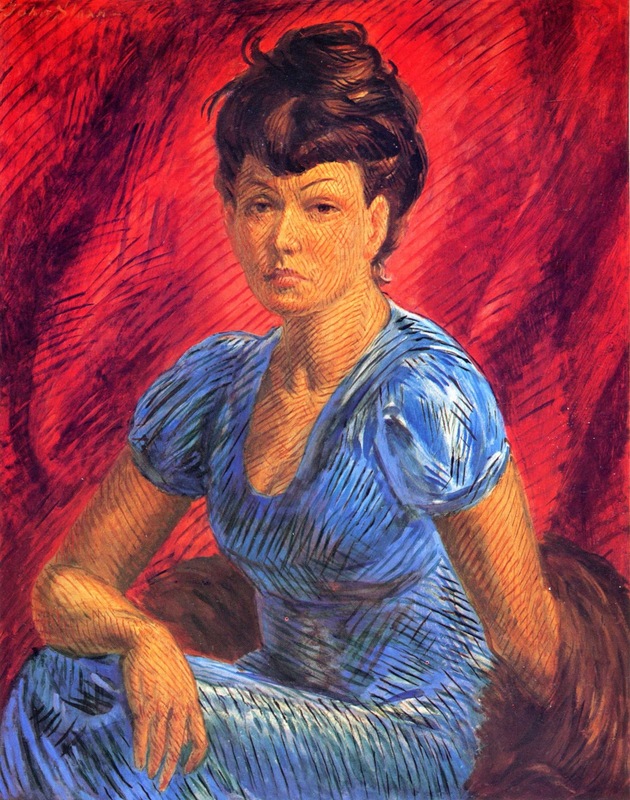 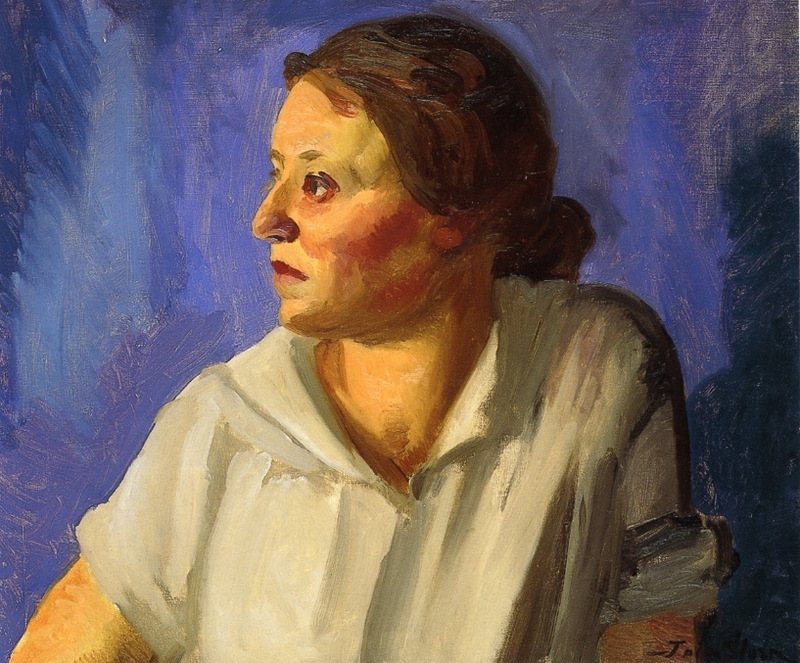 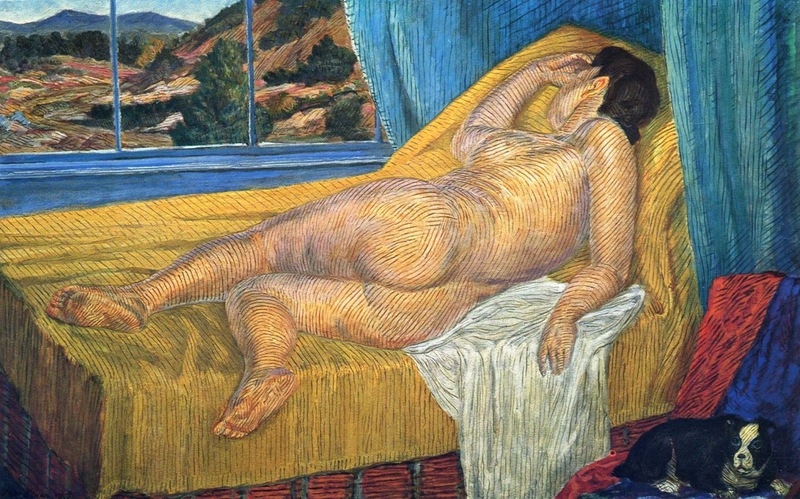 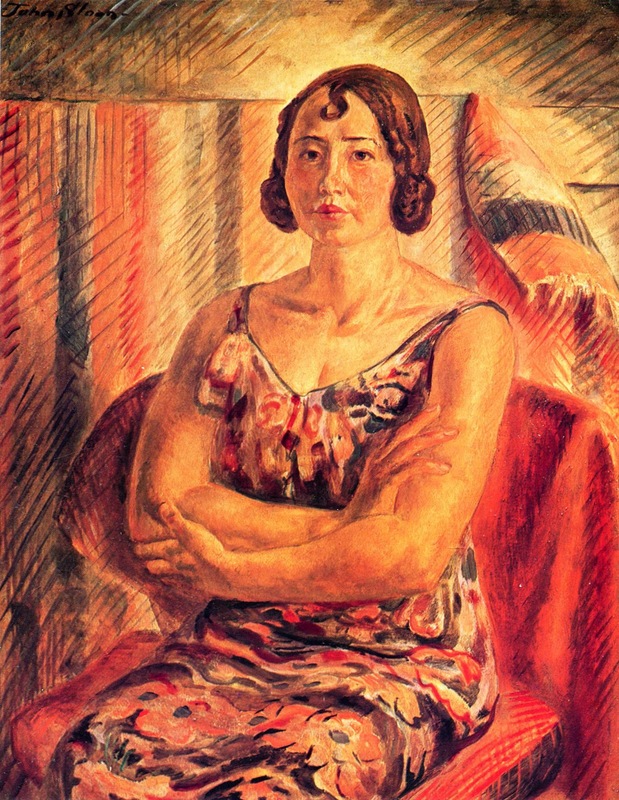 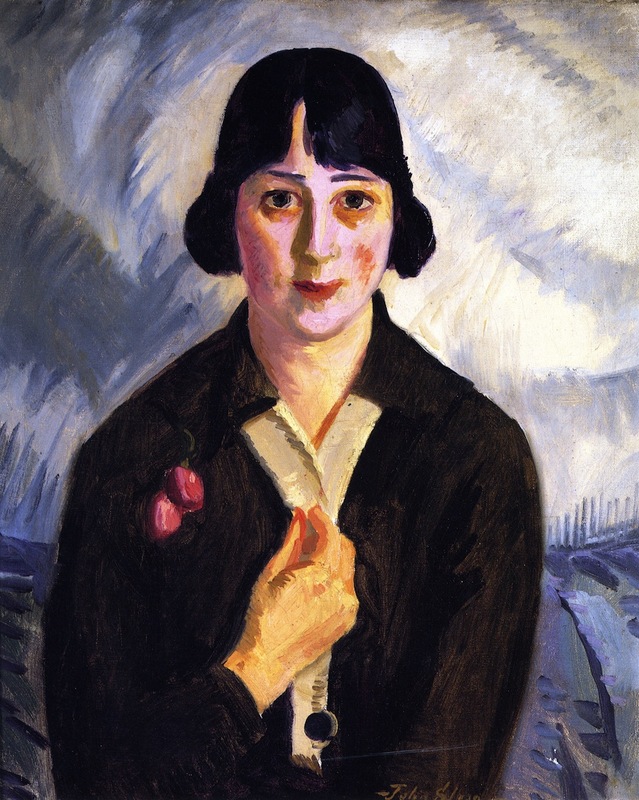 During the late 1920s he began painting figures and portraits. 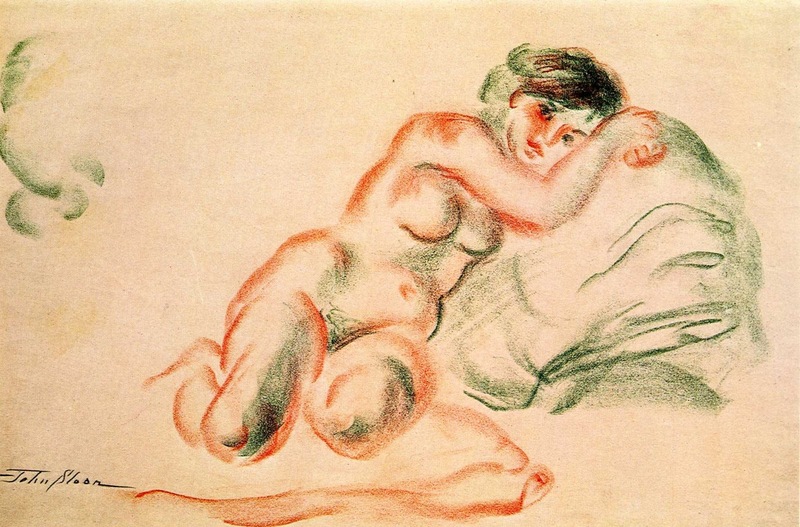 In 1939 he published a book of his teachings titled Gist of Art. 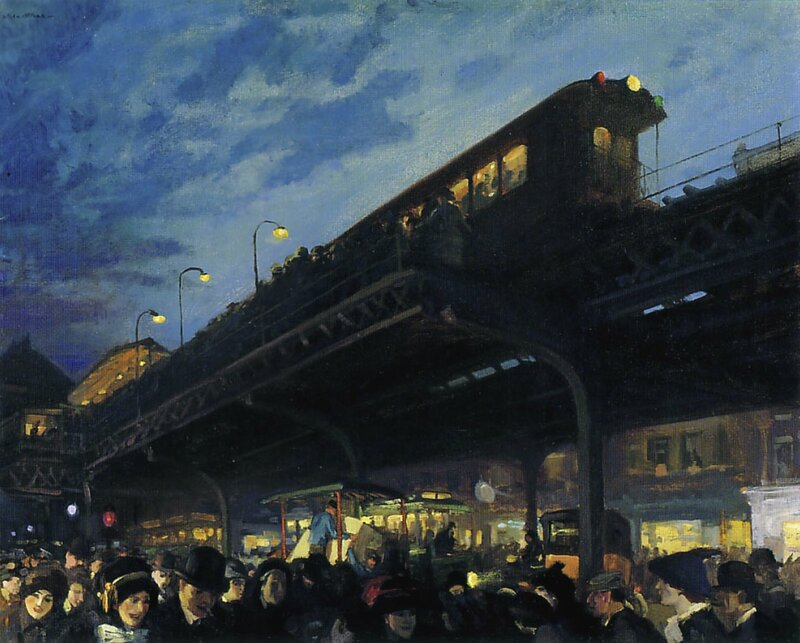 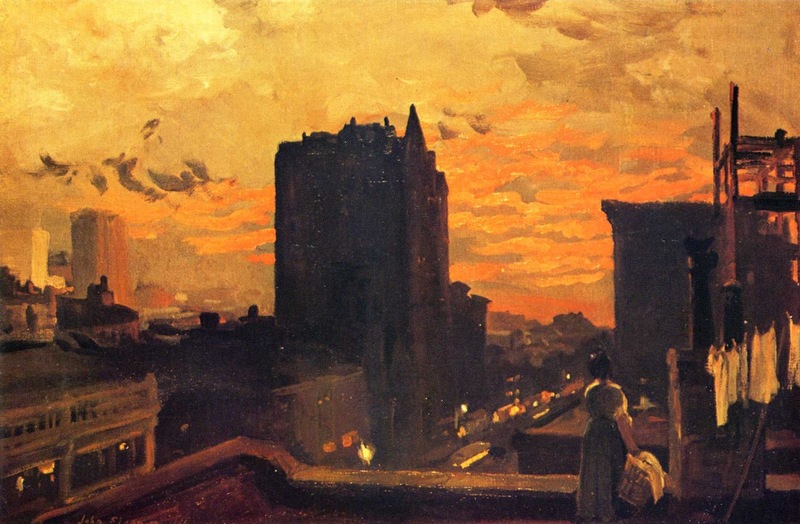 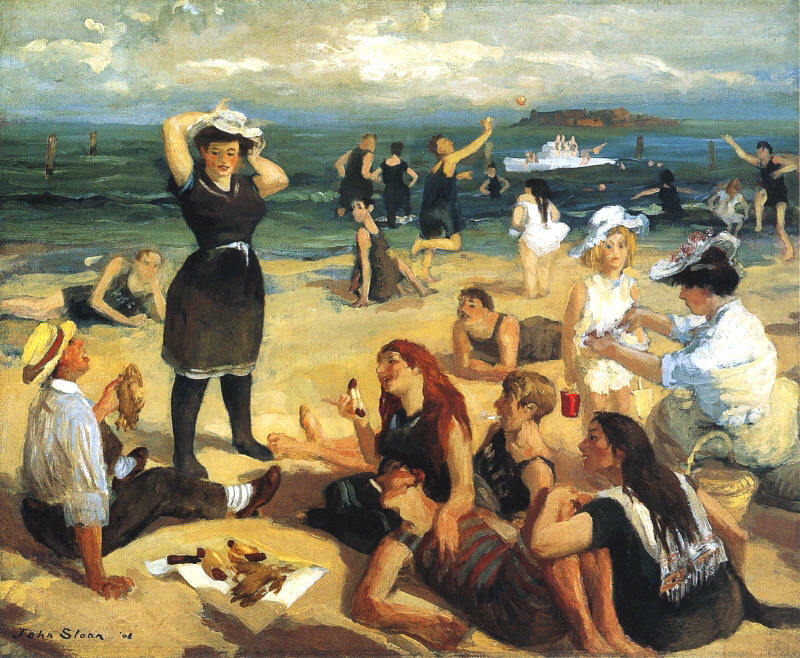 John French Sloan (Lock Haven, 2 agosto 1871 - Hanover, 7 settembre 1951) è stato un pittore Statunitense ⎆, e uno dei fondatori della scuola d'arte americana Ashcan. 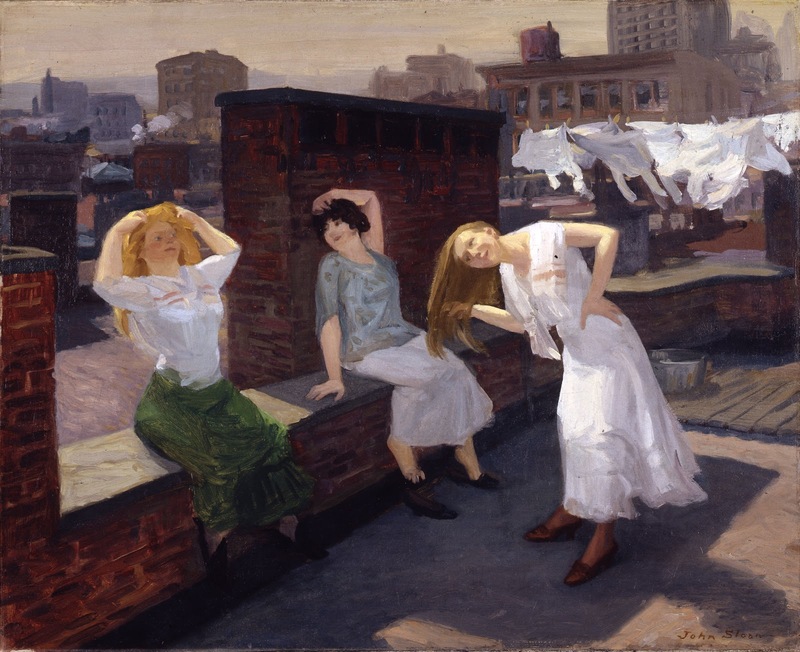 The White Way (1927) nella collezione del Philadelphia Museum of Art. 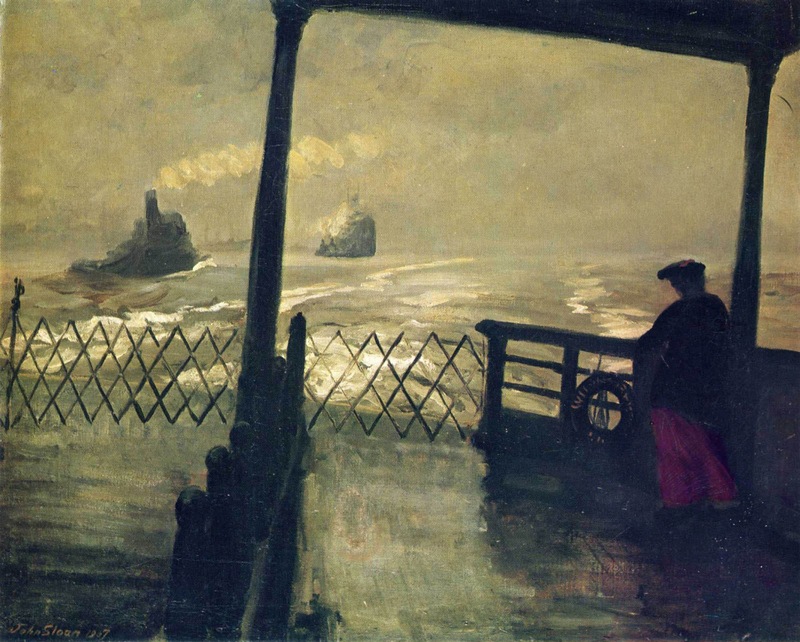 Nel 1971 il dipinto Wake of the Ferry (1907) fu riprodotto in un francobollo statunitense in onore di Sloan. 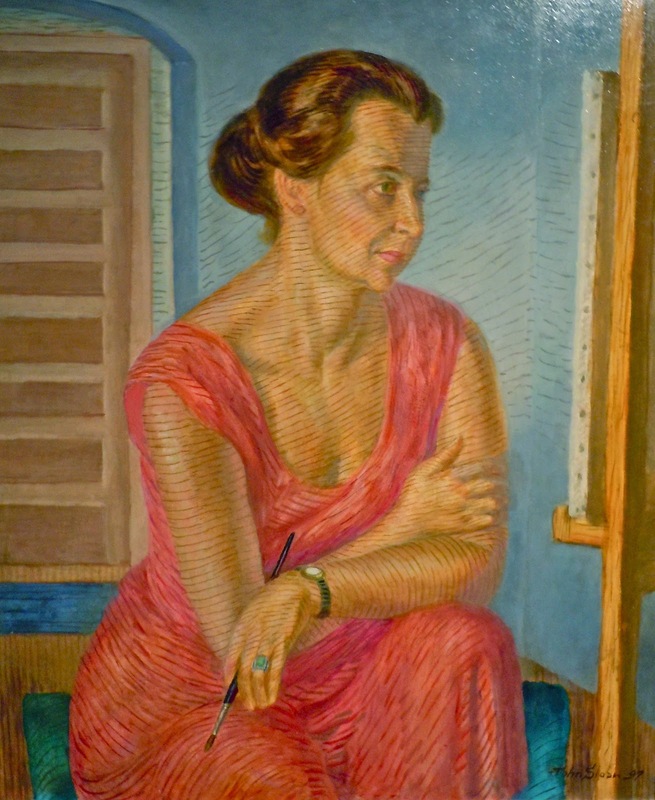 Tra i suoi studenti figurano Peggy Bacon, Aaron Bohrod, Alexander Calder, Reginald Marsh, Barnett Newman, e Norman Raeben. 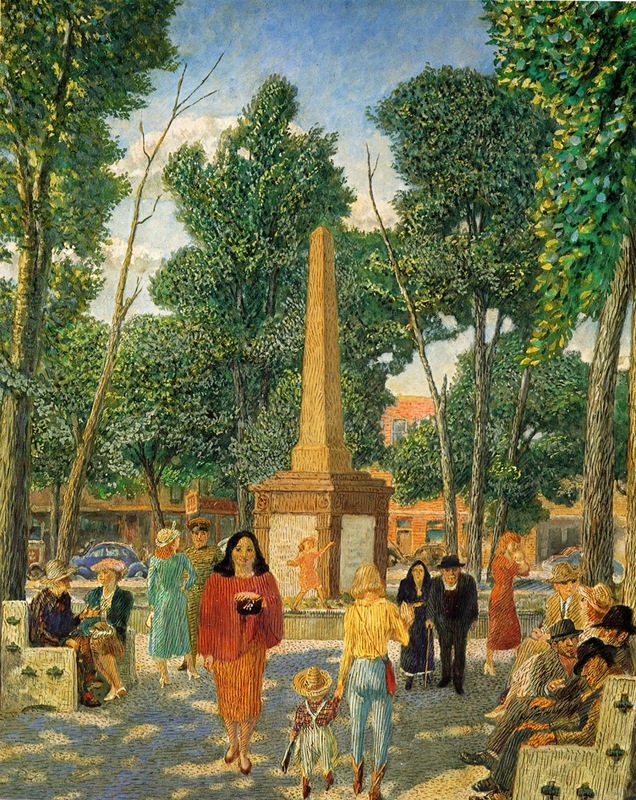 Nel 1939 pubblicò un libro sui suoi insegnamenti ed aforismi, Gist of Art, che rimase in stampa per oltre sessant'anni. 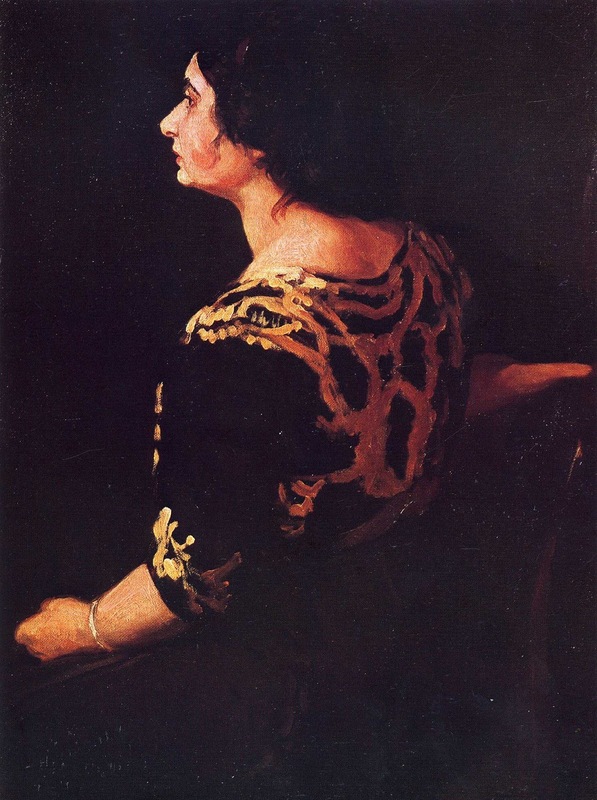 ''un’umanità onesta, una simpatia sincera ed un rifiuto di appiattire i suoi soggetti in stereotipi di figure di basso ceto sociale. 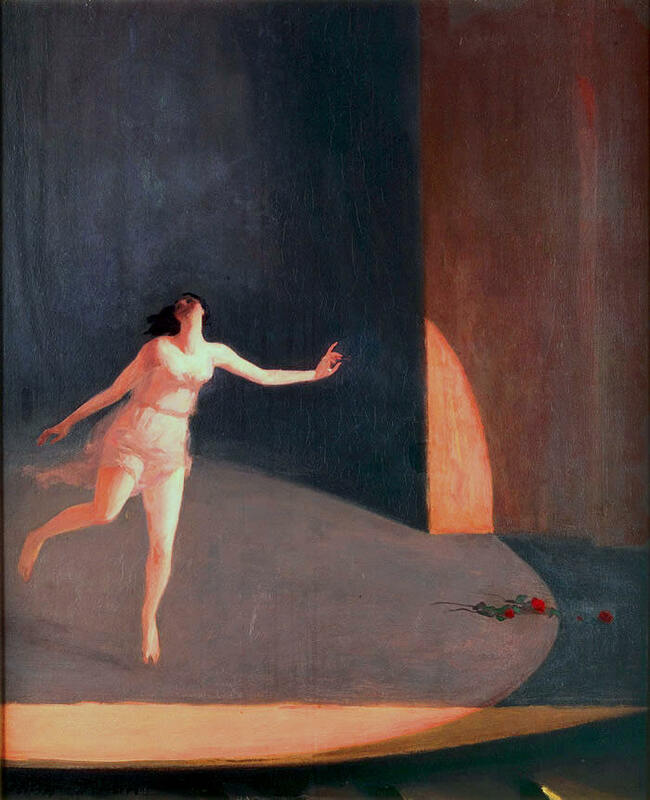 Vedeva le persone come parte di una più grande totalità, il corpo carnale e accogliente della città stessa''. 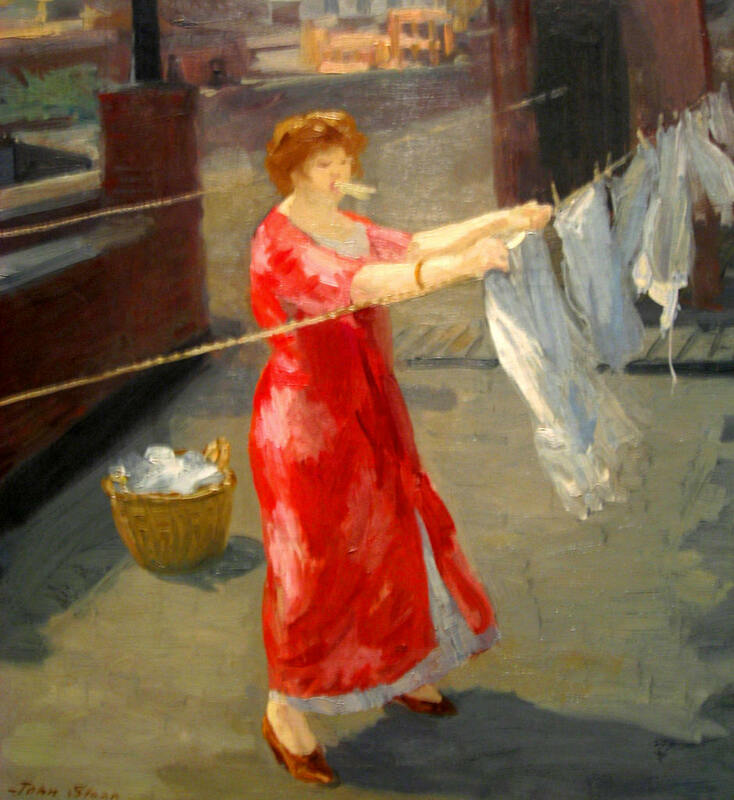 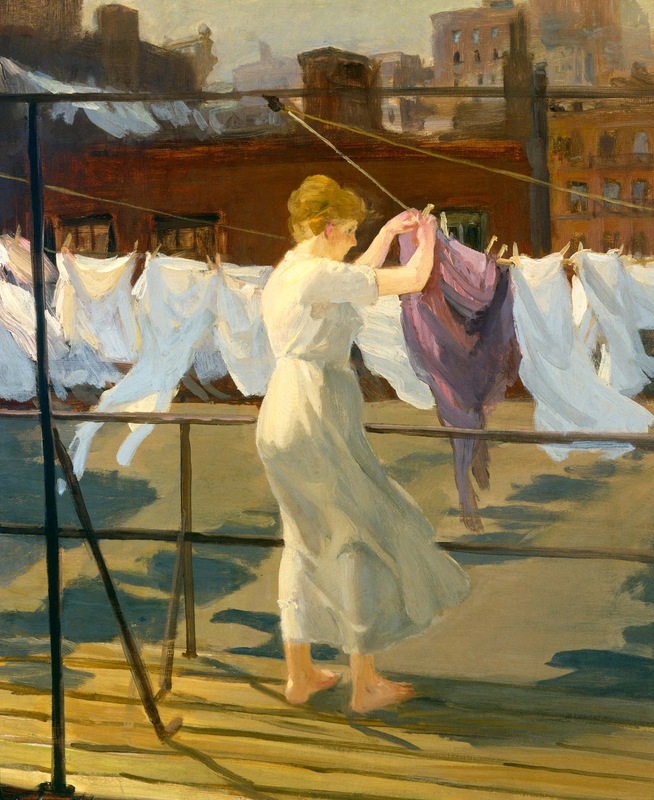 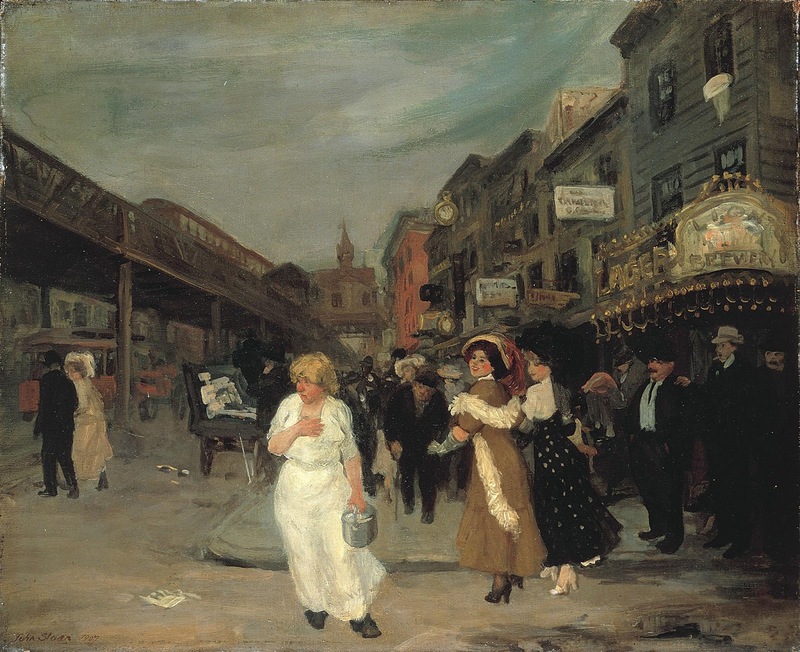 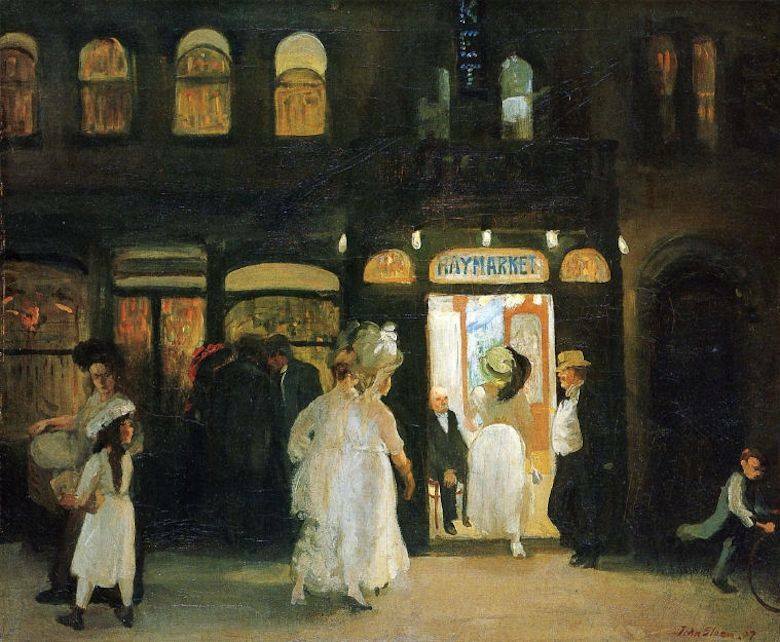 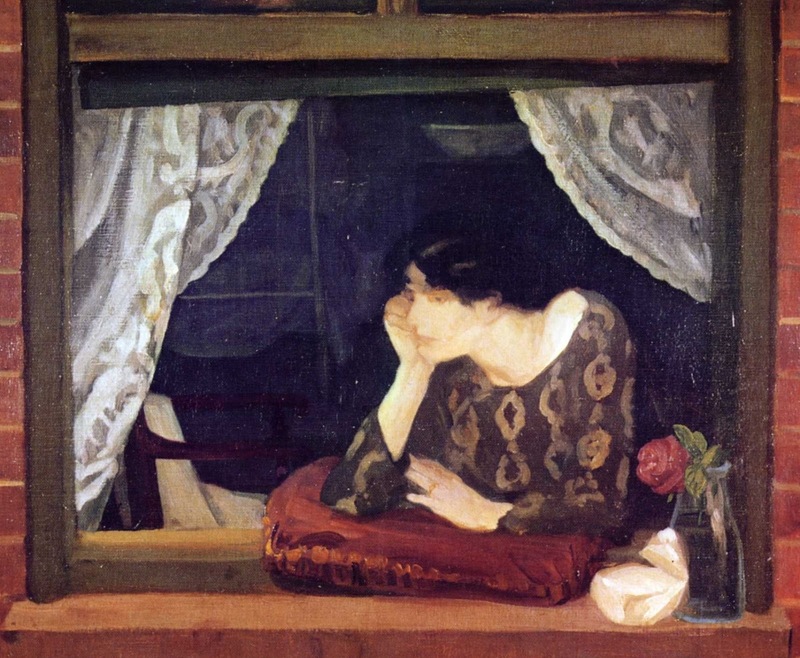 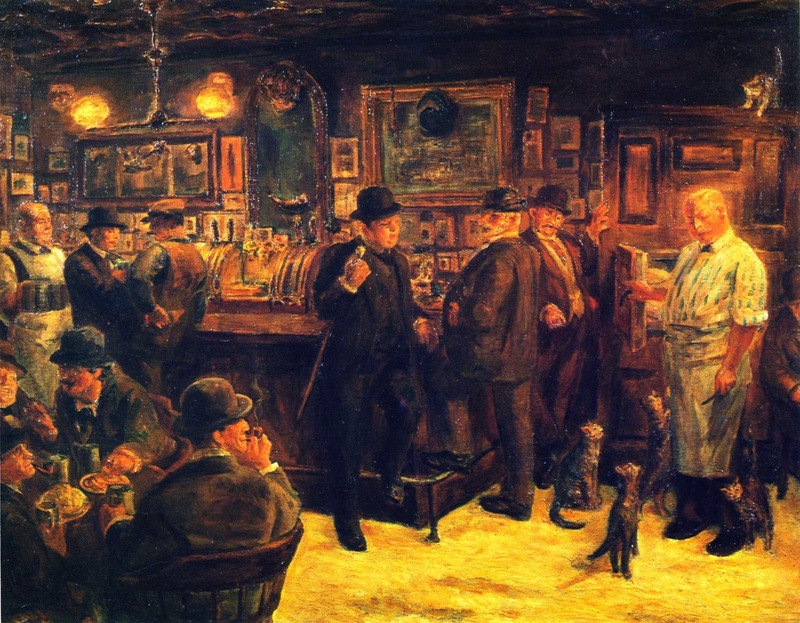 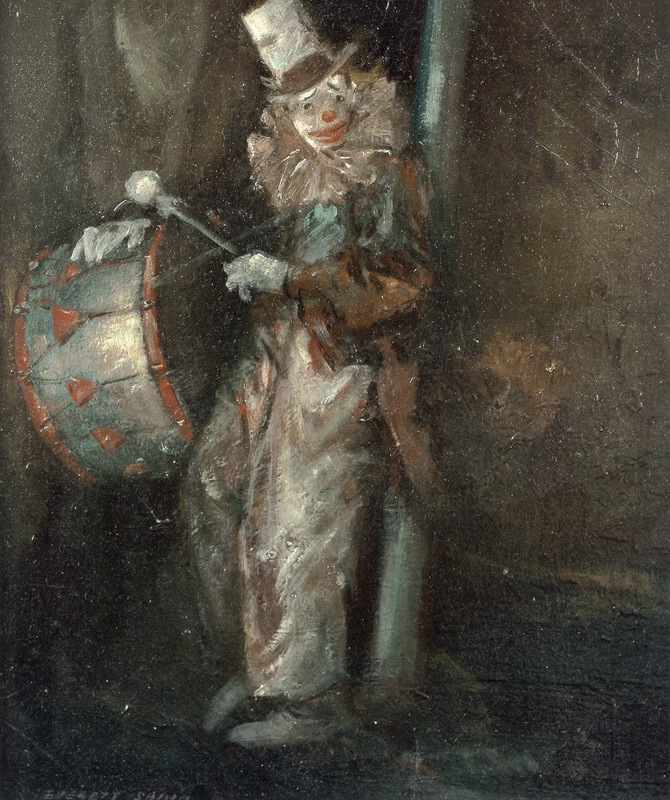 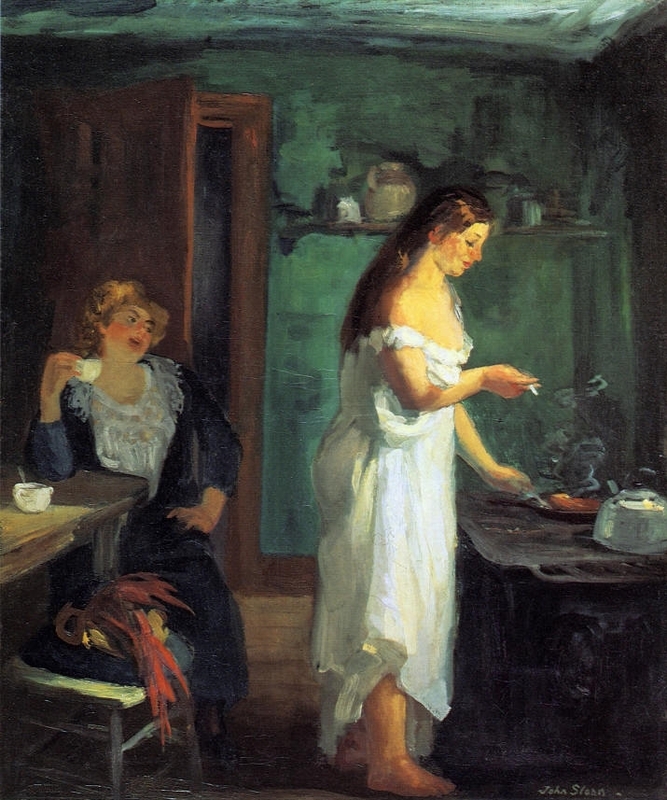 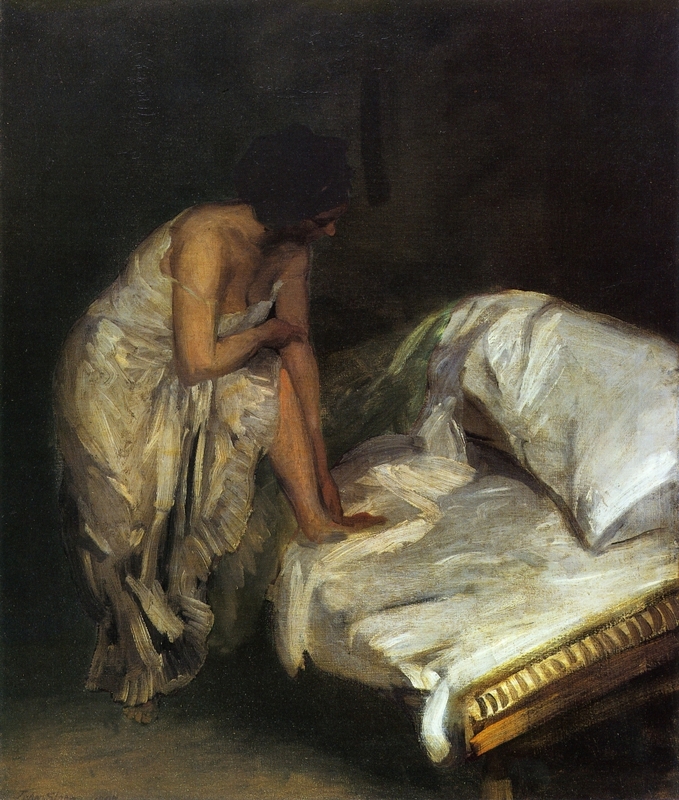 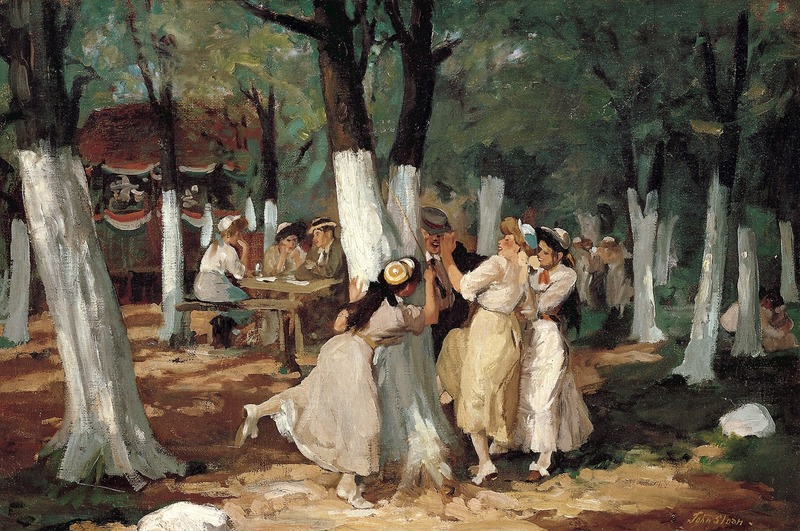 “la figura rilevante della Ashcan School". 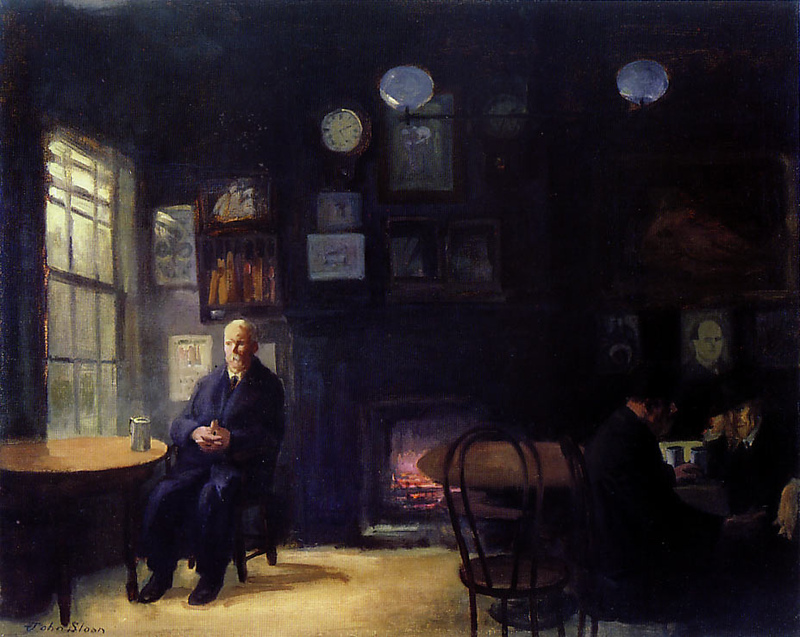 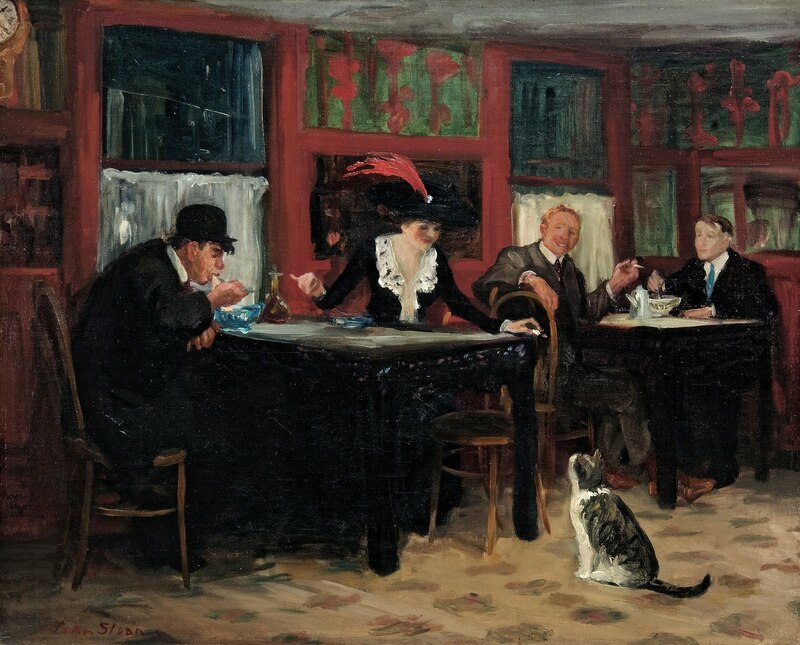 Secondo il suo amico pittore John Butler Yeats ed il critico d’arte Henry McBride, Sloan era l'“Hogarth americano” (un pittore, incisore e autore di stampe satiriche inglese).